Traditionally, tongue-type calcaneal fractures have been treated using internal fixation. External fixation has been described to a lesser degree in the treatment of these injuries, though not in the setting of an open fracture. We present a case of an open tongue-type calcaneal fracture treated with external fixation, utilizing a tensioned wire affixed to the frame that imparts compression across the fracture site. With this method, maximal respect to the soft tissues is rendered, and soft tissue insult is minimized. This patient achieved timely soft tissue coalescence and fracture union, with a return to pre-injury activities. To our knowledge, this technique has not been previously described in the treatment of an open calcaneal fracture of the posterior tuberosity. 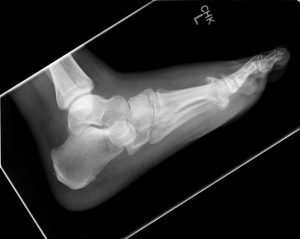 A fracture of the calcaneus, despite being the most common fracture regarding the tarsal bones, occurs only 11.5 instances in 100,000, according to a 10 year epidemiological study . Open calcaneal fractures are diagnosed in merely 5-13 percent of these injuries collectively [2-5]. The surgical indications for calcaneal fractures are controversial. Soft tissue complications are abundantly reported in the literature concerning open reduction internal fixation of closed calcaneal fractures [6-9]. In fact, there is literature advocating non-operative treatment of displaced intra-articular fractures to attempt prevent these soft tissue complications . However, an open calcaneal fracture is considered a surgical emergency. This situation presents a unique surgical obstacle regarding initial stabilization and definitive fixation. A variety of techniques have been described in the initial and subsequent management of open fractures in general [11-16]. The literature, however, is scant with recommendations addressing minimally invasive soft tissue friendly surgical options for open calcaneal fractures. The primary goals of open fracture management include prevention of infection and soft tissue compromise, which can be achieved through aggressive surgical irrigation and debridement, parenteral antibiotics, anatomic reduction of the fracture and stabilization of the osseous fragments. Osseous union and restoration of function are also sought, as with treatment of any orthopedic injury . This often requires a staged surgical approach with initial debridement and often external fixation for stabilization, followed by internal fixation once soft tissues have coalesced . This protocol, although arguably the gold standard in open fracture management, is not without drawbacks. These includes increased hospital and patient costs, length of hospital stay and associated risks such as deep vein thrombosis, as well as risks of anesthesia [19-23]. The primary aim of this case report is to present a single stage technique for the treatment of open tongue-type calcaneal fractures. 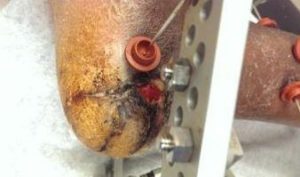 In this report, one patient with an open calcaneal fracture underwent irrigation and debridement with application of external fixation and fracture fixation through bent wire technique, achieving a favorable outcome. Despite some literary evidence supporting multi-staged surgical management of open calcaneal fractures, this report provides a single stage technique that has shown promise regarding reduction of soft tissue complications and return to function, while reducing the aforementioned multi-stage surgical pitfalls. 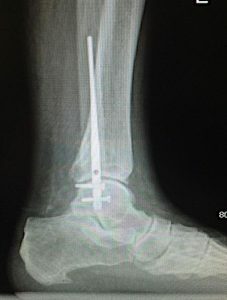 A single patient received external ring fixation with bent wire technique after presenting to the emergency department with an open tongue-type calcaneal fracture. 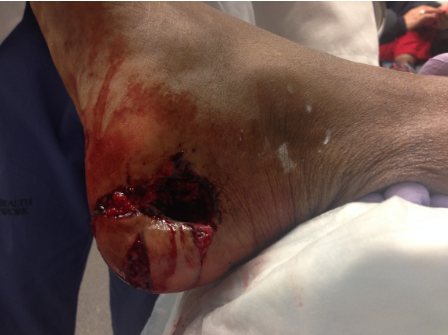 This was a work related injury resulting from a steel beam impact and laceration through a work boot. 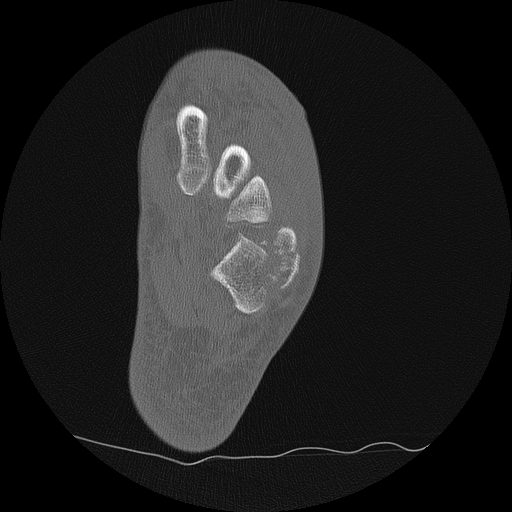 Clinically the patient presented with a medial heel deficit measuring 1.0 cm x 6.0 cm down to the level of bone, with minimal gross debris present (Figure 1). An adjacent full thickness deficit was noted to the plantar heel, not extending to bone (Figure 1). 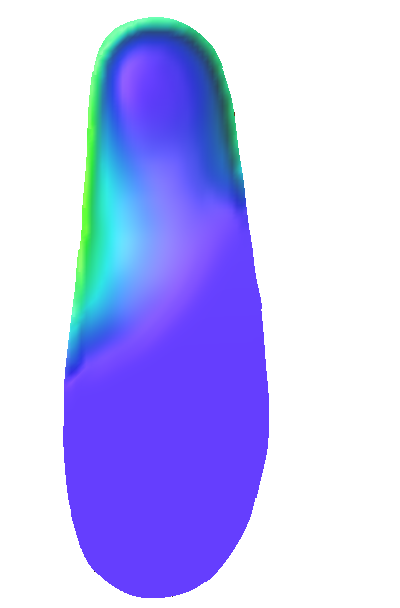 Tenting of the posterior heel was evident. The patient was deemed neurovascularly intact on examination. 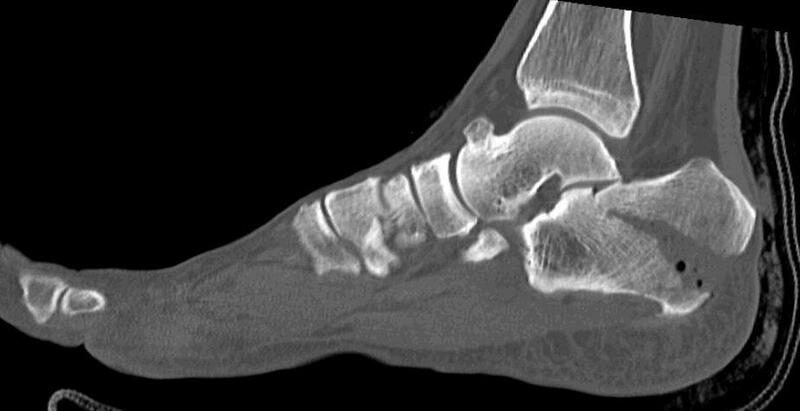 Standard radiographs diagnosed an isolated tongue-type calcaneal fracture (Figure 2), with evidence of intra-articular involvement of the posterior facet visualized on CT scan (Figure 3). The patient received TDaP tetanus vaccine and Ancef upon arrival to the emergency department. Figure 1 Clinical photograph of the patient upon presentation to the emergency department. The large medial defect extends to bone. The smaller, more posterior defect, did not extend to bone. There was no evidence of gross contamination. Figure 2 Lateral radiograph demonstrating the tongue-type calcaneal fracture with significant displacement. Initial bedside irrigation and debridement was performed, however closed reduction of the posterior tuber avulsion was unsuccessful. Verbal and written consent was obtained to then proceed with surgical intervention. Figure 3 A CT scan clearly demonstrates the intra-articular nature of the fracture. Soft tissue emphysema is clearly evident. Figure 5 Closure of the medial heel defects using subcuticular Monocryl. The patient received IV antibiotics preoperatively and under mild sedation was brought into the operating room. He was placed supine on the operating table. A formal surgical “time-out” was performed in which the patient, procedure and site were identified. The patient underwent general anesthesia without complication and the operative limb was scrubbed, prepped and draped in usual aseptic manner. A tourniquet was not raised so as to appropriately control hemostasis intra-operatively. The soft tissue defect was irrigated with 9 liters of sterile saline and closed primarily utilizing subcuticular Monocryl® (poliglecaprone, Ethicon, Inc., a division of Johnson & Johnson, Somerville, NJ). After application of a standard pre-built multi-plane Ilizarov external fixator to the operative extremity, two k-wires were placed in bicortical fashion through the superior fragment of the calcaneus and a single k-wire was placed through the inferior fragment, also bicortically. Manually, the superior wires were then bent down to the frame inferiorly, imparting compression across the fracture site. Tensiometers were then used to tension the wires to the foot plate at 75N. After tensioning, intraoperative fluoroscopy was utilized to confirm anatomic reduction and fracture compression (Figure 4). A secondary fracture of the plantar aspect was also noted on fluoroscopic imaging and fixated using two 2.0mm Steinmann Pins. The incision site was closed with subcuticular Monocryl (Figure 5). An incisional negative pressure wound vac was applied to the site of open fracture and the operative extremity was placed in a compressive dressing. The external fixator was then dressed in a sterile surgical dressing. Immediate post-operative radiographs are presented in Figure 6. The patient was admitted for IV antibiotics based on our facility’s open fracture protocol. The incisional vac was removed prior to discharge at post-op day 2. The laceration was reinforced with simple suture after debridement of mild skin edge necrosis at the apex. 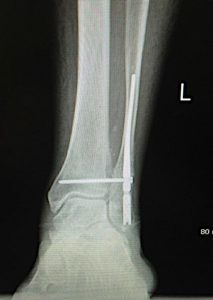 Figure 6 Postoperative lateral radiograph demonstrating anatomic fracture reduction. Figure 7 Clinical image at 2 weeks postoperatively after suture removal. The Steinmann pin was removed as well due to loosening. Figure 8 Clinical image at 5 weeks showing the superficial nature of the wound. Figure 9 Trabeculation is seen across the fracture lines on lateral and lateral oblique radiographs at 5 weeks post-operatively. The patient was evaluated in clinic at one week and two weeks postoperatively for soft tissue scrutiny. 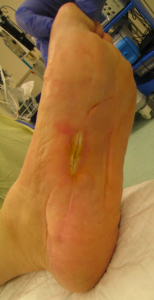 In the interim, the patient had been undergoing twice weekly dressing changes via home health with packing changes to area of apical necrosis and silver dressings along the coapted skin edges. Figure 10 Lateral radiograph at 10 weeks postoperatively with union noted at the primary fracture line. Figure 11 Union of both fracture lines is appreciated at 4 months post-operatively. Sutures were removed at two weeks as well as the Steinman pin due to loosening (Figure 7). The apical wound was addressed in clinic with serial packing and ultimately porcine trilayer grafting. At 5 weeks, the wound was superficial (Figure 8 a,b). Trabeculation could be appreciated radiographically at this time via standard radiograph (Figure 9). Osseous union was visualized at eight weeks postoperatively. 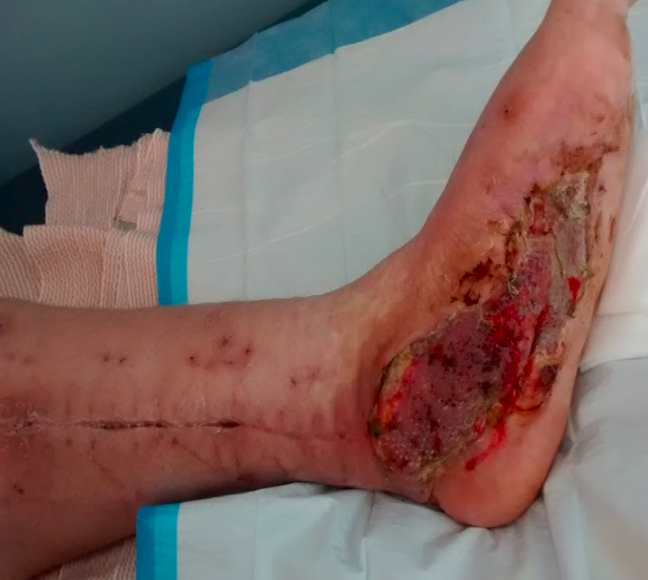 The patient underwent external fixator removal (Figure 10) and amniotic graft application at 9 weeks postoperatively for stagnant healing of the apical wound. Figure 12 Clinical image of the patient 10 months post-operatively. The patient was then transitioned to full weight bearing over the next four weeks with progression through a controlled ankle motion boot. Radiographs at 4 months display union of both fracture lines (Figure 11). At the most recent appointment, 10 months post-operative, patient has returned to work without restrictions. Currently, the patient’s only complaint is intermittent pain and tenderness to touch along the medial heel. According to the patient, the frequency of these sensations has slowly decreased over time. It is unclear at this time to what extent his neuritic symptoms will resolve. His medial heel has remained ulceration free and is in neutral position in resting calcaneal stance position (Figure 12 a,b). It was noted that the patient had a slight increase in heel width, however the patient was able to return to tennis shoes and work boots that he was wearing pre-injury without complaints. In their seminal work Takahashi, Mitsuaki, and Saegusa described a technique treating a similar calcaneal fracture presentation. Although their case report describes a closed injury, the principles of careful soft tissue management remain the same through the application of external fixation. While their efforts attempt to prevent an impending open fracture, the so called “open fracture in evolution”, we present an attempt to prevent further insult to an already compromised soft tissue envelope. In closed injuries, the “Hurricane Strap” form of internal fixation that we have previously described has been our preferred fixation modality for tongue-type calcaneal fractures. Ilizarov fixation was first described for this fracture pattern by Ramanujam et al., however, the reduction was maintained by placing the ankle in plantarflexion by way of the fixator and thus reducing the deforming force of the Achilles tendon. In their technique, Steinmann pins are placed across the fracture site but not affixed to the frame. Yet, prolonged immobilization of the ankle joint in a high degree of plantarflexion could result in contracture that would make weight bearing after fixator removal difficult. Takahashi et al. were the first to describe reduction by way of tensioned wires. To our knowledge, we are the first to describe this technique in the scenario of an open fracture. Fixation of the interfragmentary wires to the fixator itself in a tensioned fashion has the advantage of imparting active compression across the fracture site rather than simply holding the fragment in place and relying on a static joint position. Conceivably, the resistance to failure would be greater biomechanically superior to a non-tensioned interfragmentary pin or wire that cannot effect compression. A saw bone model allows for a true appreciation of the technique (Figure 13 a,b). A schematic is provided to further illustrate this method (Figure 13c). We concede that this technique would be of limited use with smaller osteoporotic fragments. In contrast however, we do not suggest fixation of these fragments. Figure 13 Bent wire construct (A) a sawbone model allows for easy visualization of the construct with the tensioned wire passing through the displaced fracture fragment. The wire is tensioned and the concave side of the arc faces in the desired direction of compression. (B) Compression across the fracture fragment from a lateral perspective. (C) A schematic of the technique superimposed on a lateral radiograph (Figure 13a and Figure 13b Reproduced from: A new treatment for avulsion fracture of the calcaneus using an Ilizarov external fixator, Injury, 44(11), Takahashi M, Noda M, Saegusa Y., 1640-3.Copyright (2013), with permission from Elsevier). We distinguish a true tongue-type fracture, as treated in this article, from the smaller Achilles avulsion fractures described by Beavis and Rowe, and the “Iowa” fracture described by Kathol [6,7,8]. Tongue-type fractures are akin to the cleavage or “wedge” type fractures detailed by Hedlund, or the Essex-Lopresti described tongue-type fracture without frank joint collapse [9,10]. Given their size and extra-articular nature, smaller avulsion fractures can often be excised without biomechanical consequence. The Achilles can then be re-anchored to the remaining calcaneus as described by Greenhagen . This is especially useful in the osteoporotic host where screw fixation is especially apt to fail, in whom these avulsion-type fractures are more common. The fracture described by Ramanujam would in fact be one such fracture pattern were we would recommend excision given its small size. Patients incurring tongue-type fractures tend to be somewhat younger than those sustaining avulsion fractures, which are largely insufficiency fractures in osteoporotic patients. In the event of a true tongue-type fracture, fixation is mandatory given their predisposition for soft tissue compromise and often concomitant articular involvement. With respect to open fractures involving the posterior calcaneal tuber, internal fixation has been the method of choice for many authors. In this scenario, retained internal fixation could of course serve as a nidus for infection and require removal, necessitating substantial incisions and thus further soft tissue trauma. Additionally, depending on the location and size of the soft tissue deficit, their initial placement could demand further dissection into the already tenuous soft tissue environment. Delays in the treatment of these injuries can undoubtedly lead to the need for rapid ascension of the soft tissue coverage ladder, even requiring free tissue transfer . These delays can be especially common in the neuropathic host. In the scenario of free tissue transfer, our technique would provide both protection of the flap as well as minimal insult to the transferred tissue. The precarious position of the posterior lower extremity in the non weight bearing patient can make offloading of this area difficult without external fixation. In conclusion, the bent wire technique has shown to be a valuable tool in our treatment of an open tongue-type calcaneal fracture and is our standard approach to treating these injuries. With minimal surgical insult to the soft tissues, wound healing concerns can be mitigated to the greatest extent possible. In the future, studies of larger sample sizes, biomechanical testing, and even direct comparison of this presented method to other fixation techniques would be useful. Mitchell MJ, Mckinley JC, Robinson CM. The epidemiology of calcaneal fractures. Foot (Edinb). 2009;19(4):197-200. Weber M, Lehmann O, Sagesser D, Krause F. Limited open reduction and internal fixation of displaced intra-articular fractures of the calcaneum. J Bone Joint Surg Br. 2008;90:1608–1616. Harvey EJ, Grujic L, Early JS, Benirschke SK, Sangeorzan BJ. Morbidity associated with ORIF of intra-articular calcaneus fractures using a lateral approach. Foot Ankle Int. 2001;22(11):868-73. Zhang X, Liu Y, Peng A, Wang H, Zhang Y. Clinical efficacy and prognosis factors of open calcaneal fracture: a retrospective study. Int J Clin Exp Med. 2015;8(3):3841-7. Siebert CH, Hansen M, Wolter D. Follow-up evaluation of open intra-articular fractures of the calcaneus. Arch Orthop Trauma Surg. 1998;117(8):442-7. Al-mudhaffar M, Prasad CV, Mofidi A. Wound complications following operative fixation of calcaneal fractures. Injury. 2000;31(6):461-4. Bergin PF, Psaradellis T, Krosin MT, et al. Inpatient soft tissue protocol and wound complications in calcaneus fractures. Foot Ankle Int. 2012;33(6):492-7. Abidi NA, Dhawan S, Gruen GS, Vogt MT, Conti SF. Wound-healing risk factors after open reduction and internal fixation of calcaneal fractures. Foot Ankle Int. 1998;19(12):856-61. Koski A, Kuokkanen H, Tukiainen E. Postoperative wound complications after internal fixation of closed calcaneal fractures: a retrospective analysis of 126 consecutive patients with 148 fractures. Scand J Surg. 2005;94(3):243-5. Griffin D, Parsons N, Shaw E, et al. Operative versus non-operative treatment for closed, displaced, intra-articular fractures of the calcaneus: randomised controlled trial. BMJ. 2014;349:g4483. Bhandari M, Guyatt GH, Swiontkowski MF, Schemitsch EH. Treatment of open fractures of the shaft of the tibia. J Bone Joint Surg Br. 2001;83(1):62-8. Gustilo, R.B., Merkow, R.L. and Templeman, D.A.V.I.D., 1990. The management of open fractures. JBJS, 72(2), pp.299-304. Byrd, H.S. and Spicer, T.E., 1985. Management of open tibial fractures. Plastic and reconstructive surgery, 76(5), pp.719-730. Chapman, M.W. and Mahoney, M., 1979. The role of early internal fixation in the management of open fractures. Clinical orthopaedics and related research, (138), pp.120-131. Sirkin, M., Sanders, R., DiPasquale, T. and Herscovici, J.D., 2004. A staged protocol for soft tissue management in the treatment of complex pilon fractures. Journal of orthopaedic trauma, 18(8 Suppl), pp.S32-8. Aldridge JM, Easley M, Nunley JA. Open calcaneal fractures: results of operative treatment. J Orthop Trauma. 2004;18(1):7-11. Cross WW, Swiontkowski MF. Treatment principles in the management of open fractures. Indian J Orthop. 2008;42(4):377-86. Diwan A, Eberlin KR, Smith RM. The principles and practice of open fracture care, 2018. Chin J Traumatol. 2018. Passias PG, Ma Y, Chiu YL, Mazumdar M, Girardi FP, Memtsoudis SG. Comparative safety of simultaneous and staged anterior and posterior spinal surgery. Spine. 2012;37(3):247-55. Collins TC, Daley J, Henderson WH, Khuri SF. Risk factors for prolonged length of stay after major elective surgery. Ann Surg. 1999;230(2):251-9. Tess BH, Glenister HM, Rodrigues LC, Wagner MB. Incidence of hospital-acquired infection and length of hospital stay. Eur J Clin Microbiol Infect Dis. 1993;12(2):81-6. Härkänen M, Kervinen M, Ahonen J, Voutilainen A, et al. Patient-specific risk factors of adverse drug events in adult inpatients – evidence detected using the Global Trigger Tool method. J Clin Nurs. 2015;24(3-4):582-91. Caminiti C, Meschi T, Braglia L, et al. Reducing unnecessary hospital days to improve quality of care through physician accountability: a cluster randomised trial. BMC Health Serv Res. 2013;13:14. Beavis RC, Rourke K, Court-brown C. Avulsion fracture of the calcaneal tuberosity: a case report and literature review. Foot Ankle Int 29:863-866, 2008. Rowe CR, Sakellarides HT, Freeman PA, et al. Fractures of os calcis. A long term follow-up study of one hundred forty-six patients. JAMA 184:920-923, 1963. Kathol MH, El-khoury GY, Moore TE, Marsh JL. Calcaneal insufficiency avulsion fractures in patients with diabetes mellitus. Radiology. 180:725-729, 1991. Hedlund LJ, Maki DD, Griffiths HJ. Calcaneal fractures in diabetic patients. J Diabetes Complicat 12:81-7, 1998. Essex-lopresti P. The mechanism, reduction technique, and results in fractures of the os calcis. Br J Surg 39:395-419, 1952. Greenhagen RM, Highlander PD, Burns PR. 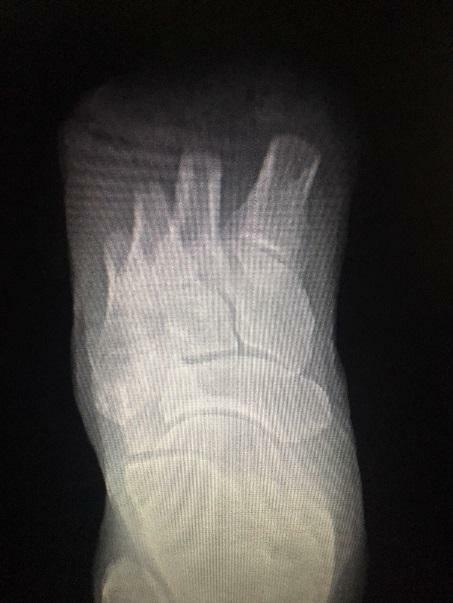 Double row anchor fixation: a novel technique for a diabetic calcaneal insufficiency avulsion fracture. J Foot Ankle Surg 51:123-127, 2012. Muscle flaps are a versatile option for limb salvage that can provide coverage for chronic ankle and foot defects that fail to heal from other conservative and surgical treatments. We discuss the use of a medial hemisoleus muscle flap for treatment of a chronic foot ulcer following dehiscence of an intrinsic pedicled muscle flap. Hemisoleus muscle flaps are utilized for soft tissue defects of the distal third of the lower extremity but are not commonly utilized for coverage of defects on the plantar foot. 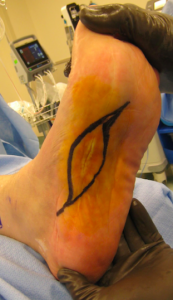 We discuss the use of a medial hemisoleus (MHS) flap for treatment of a chronic foot ulcer following dehiscence of an intrinsic pedicled muscle flap. This case study presents our treatment of a chronic wound that failed to heal despite local wound care and several attempts at primary closure. We present our surgical technique for mobilizing the MHS flap and recommend concomitant use of external fixation to decrease motion of the flap on the wound bed, allowing for neovascularization and full incorporation. 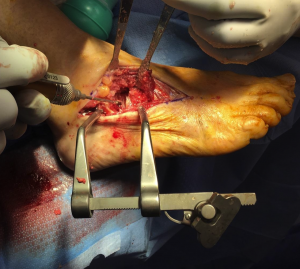 A case is presented of a fifty-seven-year-old male who underwent a plantar fasciotomy with a subsequent postoperative soft tissue infection. This resulted in a chronic, painful wound to the plantar medial left foot after the infection resolved. Non-invasive vascular studies and clinical vascular examination were normal. He failed conservative therapy including local wound care and offloading and elected to undergo primary closure eight months after the plantar fasciotomy. A fissure developed along the incision six weeks postoperatively and persisted for nine months despite continued wound care. A second attempt at primary closure was made and approximately three weeks later the incision partially dehisced. Progressive healing was achieved for three months, but the patient fell at this time which resulted in the wound reopening. An MRI was obtained and ruled out osteomyelitis or presence of a foreign body. The patient then elected to undergo scar excision with the placement of an abductor hallucis muscle flap. The patient had an uneventful postoperative course and was transitioned to heel weight bearing at twelve weeks postoperatively. At four months postoperatively, the incision partially dehisced and became a chronic ulcer (Figure 1). Figure 1 Preoperative (A) Chronic ulceration to plantar medial left foot (B) Ellipsoid excision of the ulcer. At this time, the patient was given the option of a below-knee amputation and he declined. 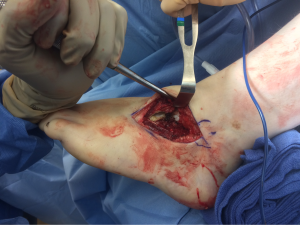 After five months of additional conservative therapy with no improvement in appearance of the wound, another attempt at closure was made by performing a medial hemisoleus flap. The decision was made to utilize an external fixator to minimize motion of the flap within the wound bed. 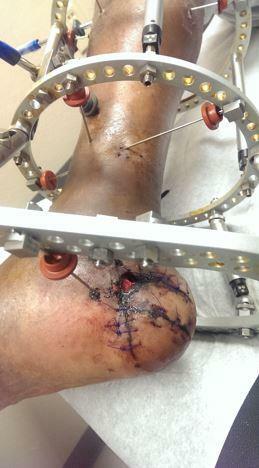 Three weeks later a split-thickness skin graft (STSG) was applied and the external fixator was removed at this time. The incisions healed and the graft and flap had completely incorporated at ten weeks postoperatively (Figure 4). The patient is ambulatory in accommodative shoe gear and has not had a recurrence of the soft tissue defect after twenty-three months of follow-up. The patient was brought to the operating room and placed on the operating room table in the supine position. A tourniquet was not utilized during the procedure. An elliptical incision was made to encompass the wound (Figure 1). Due to previous surgeries, a significant amount of scar tissue was encountered that extended to the level of the plantar musculature. Attention was directed to the tarsal tunnel and dissection was carried through the flexor retinaculum. The wound was irrigated with copious amounts of normal saline and all nonviable soft tissue was excised; leaving a large soft tissue defect (Figure 2). 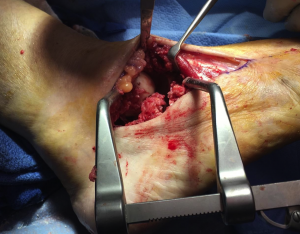 Figure 2 Intraoperative (A) Excision of Chronic Wound (B) Incision and dissection of medial soleus (C) Closure with application of External Fixation for ankle motion and flap protection. The decision was made to transpose a medial hemisoleus muscle flap for coverage of the defect. Continuing the incision from the tarsal tunnel, a longitudinal incision was made over the medial aspect of the calf. The incision was carried down to the crural fascia. The fascia was incised longitudinally allowing exposure to the gastroc-soleus muscle complex. The soleus muscle belly was identified and the medial portion of the muscle was transected proximally and freed from lateral muscle belly along the central raphe down to the level of the tarsal tunnel. An intraoperative doppler was utilized during this dissection to identify perforators of the muscle. With sharp dissection, the epimysium was excised. The muscle was transposed through the tarsal tunnel and placed within the plantar soft tissue defect. 3-0 nylon was used to secure the flap in the proper position, with no tension on the flap. The medial incision was closed in layers and the skin was closed with staples. Vessel loops in a zig-zag pattern were used to reduce tension to the edges of the incision. Figure 3 Intraoperative (A) status post 3 weeks from muscle flap (B) Fenestrated STSG applied to debrided muscle flap. 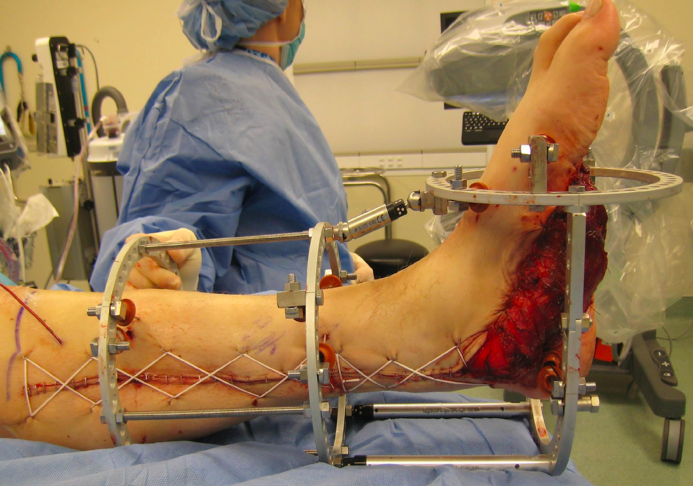 An external fixator consisting of a tibial block with two full rings and a distal block with a full ring was used to encompass the forefoot. Opposing olive wires were inserted using standard techniques. 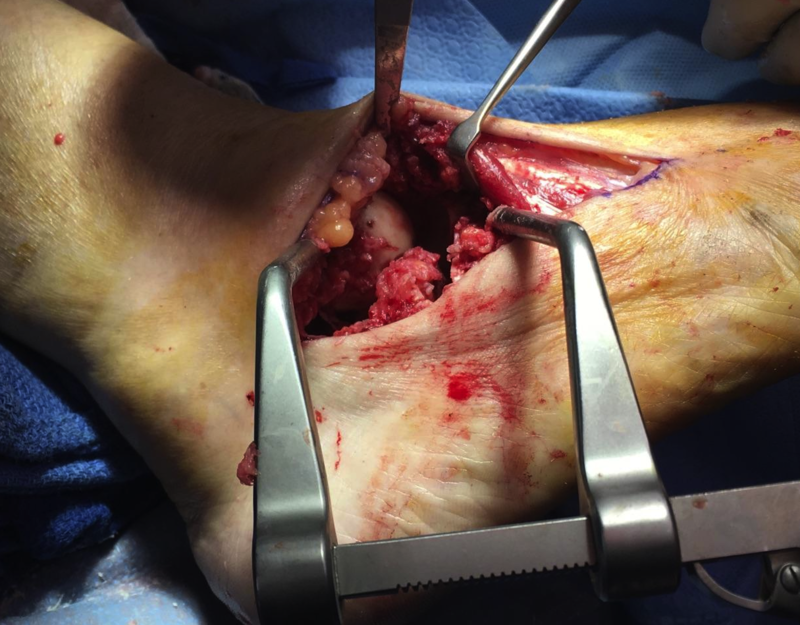 Three weeks following the frame application, the patient was brought back to the operating room for debridement of the muscle flap and application of a split-thickness skin graft (STSG). 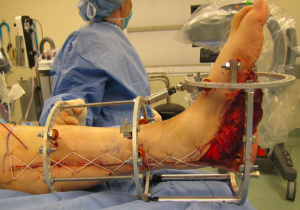 The external fixator was removed and extremity was prepped and draped in a sterile manner. The muscle flap was debrided of eschar tissue, leaving a mixture of bleeding granular and muscular tissue (Figure 3). The muscle flap measured 3cm x 9cm. The site was covered with an intermediate STSG harvested from the proximal left thigh with use of a dermatome. The skin graft was meshed and sutured in place using 3-0 Monocryl. The skin graft was covered with a sterile dressing and a wound VAC was applied. 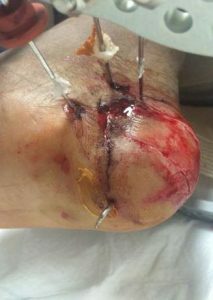 The STSG was fully incorporated after 10 weeks of local wound care (Figure 4). MHS flap reliability has been questioned due to variability in vascularity, but successful coverage of distal lower extremity defects have been reported. Our use of a MHS flap for plantar foot defects is a novel application. The performing surgeon should have an in-depth knowledge not only of the muscular but also of the vascular anatomy. There are many classifications within the literature discussing mapping the vasculature of the lower leg. Figure 4 Clinical images (A) healing STSG five weeks postoperatively and (B) fully incorporated split thickness skin 10 weeks graft. Angiosomes should always be acknowledged throughout the surgical planning and intervention. Angiosomes are a unit consisting of the skin, subcutaneous tissue, fascia, muscle, and bone being supplied by a source artery. The human body has forty angiosomes, with six being located in the foot and four located within the lower leg [1,2]. Mathes and Nahai’s classification divides muscle flaps accordingly to their blood supply. The soleal muscle flap is a type II flap, meaning it has one major pedicle and several minor pedicles [2,3]. Its dominant pedicle is the posterior tibial artery and the perforating branches of this artery are the secondary pedicles [2,4-7]. The vascular supply of the medial soleus muscle body is mainly from the posterior tibial artery (PTA) via multiple minor pedicles [4,5,8]. The medial soleus has perforators from the PTA extending the length of the muscle [9,10]. Ward, et al. state that perforators can be found on the posterior border of the tibia roughly 5 cm, 10 cm, and 15 cm proximal to the ankle joint . Similarly, Raveendran, et al. report the distal perforating arteries of the PTA averaged 6.5 cm, 11.6 cm, and 16.8 cm from the medial malleolus . When planning for coverage, the entire soleal muscle can cover defects approximately 26 cm2 . However, the MHS has an extended arc of rotation compared to a full soleal flap which allows a greater percentage of coverage [6,7,13,14]. The medial soleus belly averages 25.4 cm in length, 6.9 cm in width, and has a mean surface area of 87.5 cm2 . Techniques, such as excising the epimysium, can also increase the flap’s range by 20% . Prior to incision, perforators should be marked appropriately along the posterior border of the tibia [9,11]. For the surgical approach, we prefer a medial incision overlying the posterior compartment. Preserving the saphenous neurovascular bundles can be achieved and blunt dissection can be utilized to separate the gastrocnemius from the soleus [2,11]. It is highly encouraged to use intraoperative doppler examination throughout the surgery to confirm the major pedicle is viable and only minor perforators are being ligated . The medial body of the soleus should be dissected from the lateral portion at the “C-point”, or the perforator located approximately 15 cm from the ankle joint . Bourdais-Sallot et al. reported the pivot point for MHS is 14.5 cm from the top of the medial malleolus or 32.5% of the tibial length . The lateral soleal muscle body is left intact to help maintain plantar-flexion at the ankle [9,2]. To our knowledge, the use of a MHS flap for coverage of a plantar foot soft tissue defect has not been previously described. MHS flaps have been used to cover defects in the proximal and distal lower extremity [7,10]. Techniques can be used to extend the range of coverage of the medial soleus in order to reach the plantar foot. With careful and proper planning, the MHS flap is an option for coverage of soft tissue defects of the plantar foot. The goal of our staged procedure was to heal the chronic ulceration and provide a functional lower extremity for ambulation. Within ten weeks of MHS flap with external fixator and STSG, the patient was able to ambulate with a well adhered and fully incorporated graft. No dehiscence has occurred in twenty-three months. Brodmann, Marianne. “The Angiosome Concept in Clinical Practice.” Endovascular Today, May 2013. Dockery, G. and Crawford, ME. Lower Extremity Soft Tissue & Cutaneous Plastic Surgery. Saunders Elsevier, 2012, pp. 269–288. Banks, AS, and McGlamry, ED. McGlamry’s Comprehensive Textbook of Foot and Ankle Surgery. Lippincott Williams & Wilkins, 2001, Pp 1513-1519. Hallock, GG. “Getting the Most from the Soleus Muscle.” Annals of Plastic Surgery, vol. 36, no. 2, 1996, pp. 139–146. Klebuc, M and Menn, Z. 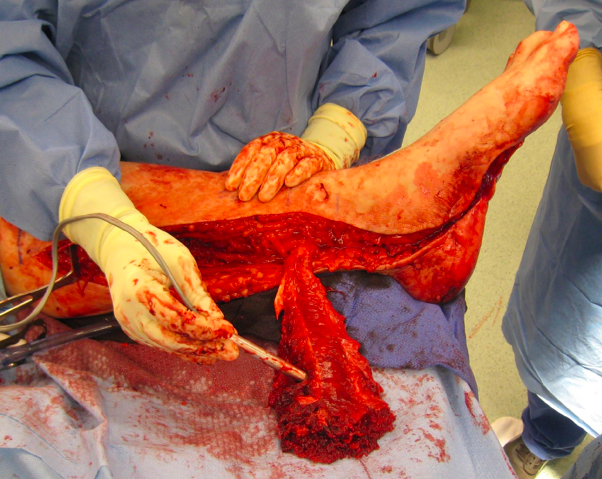 “Muscle Flaps and Their Role in Limb Salvage.” Methodist DeBakey Cardiovascular Journal, vol. 9, no. 2, 2013, pp. 95–98. Pu, Lee LQ. “Soft-tissue reconstruction of an open tibial wound in the distal third of the leg: a new treatment algorithm”. Plastic and Reconstructive Surg. 2007;58(1): 78-83. 4. Pu, Lee LQ. “ Successful soft-tissue coverage of a tibial wound in the distal third of the leg with a medial hemisoleus muscle flap”. Plastic and Reconstructive Surg. 2005;115(1):245-51. Tobin, CR. “Hemisoleus and Reversed Hemisoleus Flaps.” Plastic and Reconstructive Surgery, vol. 76, no. 1, 1985, pp. 87–96. Sayed, AT. “Distally Based Medial Hemi-Soleus Muscle Flap Based on the Posterior Tibial Vessels”. AAMJ, Department of Plastic and Reconstructive Surgery, Faculty of Medicine Al-Azhar University; Vol.7,N.1, January 2009. Schmidt, I. “The Proximally and Distally Pedicled Hemisoleus Muscle Flap as Option for Coverage of Soft Tissue Defects in the Middle Third of Lower Leg.” Trauma and Emergency Care, vol. 2, no. 6, 2017. Ward, KL, et al. “Cadaveric Atlas for Orthoplastic Lower Limb and Foot Reconstruction of Soft Tissue Defects.” Clinics in Surgery, vol. 3, 28 June 2018. Raveendran, SS, and Kumaragama, KGJL. “Arterial Supply of the Soleus Muscle: Anatomical Study of Fifty Lower Limbs.” Clinical Anatomy, vol. 16, no. 3, 2003, pp. 248–252. Pu, Lee LQ. “The Reversed Medial Hemisoleus Muscle Flap and its Role in Reconstruction of an Open Tibial Wound in the Lower Third of the Leg”. Ann Plast Surg 2006 Jan;56(1):59–63. Pu, Lee LQ. “Further Experience with the Medial Hemisoleus Muscle Flap for Soft-Tissue Coverage of a Tibial Wound in the Distal Third of the Leg.” Plastic and Reconstructive Surgery, vol. 121, no. 6, 2008, pp. 2024–2028. Bourdais-Sallot, A, et al. “Distally Based Medial Hemisoleus Muscle Flap: Anatomic and Angiographic Study of 18 Lower Limbs”. Annals of Plastic Surgery, vol. 79, no. 1, 2017, pp. 73–78. Houdek, MT, et al. “Reverse Medial Hemisoleus Flaps for Coverage of Distal Third Leg Wounds.” Journal of Orthopaedic Trauma, vol. 30, no. 4, 2016. Gas gangrene is a bacterial infection that produces gas in tissues. It is fast spreading, potentially life-threatening and needs to be addressed promptly. In this case report, we present a patient that presented with gangrene of his left foot. He was first seen in the emergency room where blood cultures and x-rays were obtained. The patient was then promptly treated with OR debridement of the site and the cultures obtained intraoperatively revealed a rare organism, Klebsiella ornithinolytica (currently called Raoultella ornithinolytica). In addition to the OR debridement, the patient was treated with 6 weeks of IV antibiotics. Gas gangrene is a form of tissue necrosis that can be life-threatening. It often occurs at the site of trauma, or recent surgical site, however, can present without an irritating event. Populations at high risk for developing gas gangrene include those with diabetes and atherosclerosis. If suspicion for gangrene is present, it is imperative to obtain tissue and fluid cultures, blood cultures, x-ray, CT scan or MRI of the area. Surgery should be performed quickly to remove dead and infected tissue. Although it is well established that Clostridium spp. causes gas gangrene; non-clostridial involvement is possible. In the present case, x-ray findings indicated gas formation and additionally, Klebsiella ornithinolytica was recovered from surgical specimens. Based on both radiological and microbiological evidence, the diagnosis of Klebsiella Ornithinolytica gas gangrene was established. The patient was treated for 6 weeks with IV antibiotics. A 56-year-old Caucasian male presented to the ER with a 3-day history of foul-smelling discharge from his right foot after having a 5th met resection 2 months ago at a civilian facility. The patient was having constant pain in the foot over the past 2 weeks. Over the last 3 days, he also noticed a redness that was going up the leg along with bluish discoloration of the fourth digit accompanied by edema. There was tenderness of the 4th digit on palpation along with the metatarsal head dorsally despite patients self-described neuropathy of his feet. The patient said that over the last day he had developed fever, chills, and nausea. His medical history was significant for uncontrolled diabetes, hypertension, cocaine abuse, and tobacco abuse. Figure 1 Demonstrating Gas Gangrene of 4th proximal phalanx. Figure 2 Post-operative radiographs of Partial 4th ray resection. 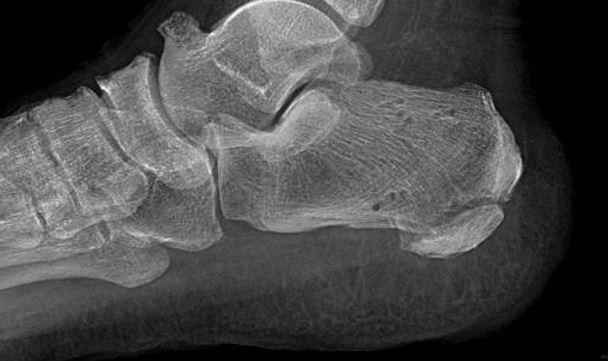 Figure 3 Post-operative radiographs of transmetatarsal amputation. The patient had a 5th ray resection from an outside facility and was unable to give us any other details nor records from that hospitalization. Inspection at the time of his first visit revealed a 3.5cm x 1.5 cm opening to the fifth metatarsal resection surgical site of the right foot. There was surrounding erythema to the surgical site and forefoot with lymphangitis streaking accompanied by a purplish discoloration to the fourth digit with pain to palpation. Also noted were calor and malodor. The dorsum of the foot was erythematous and edematous over the 4th digit and fourth metatarsal. There was a local increase in skin temperature on the dorsal aspect of the left foot compared to that of the contralateral foot. The dorsalis pedis and tibialis posterior pulses were easily palpated and capillary return was within normal limits. His initial temporal temperature was 100.7. The inguinal lymph node palpation was negative. The chest radiograph obtained displayed no evidence of an acute cardiopulmonary abnormality. Significant lab findings were an erythrocyte sedimentation rate of 37, white blood cell (WBC) count of 16.8, Glucose of 305 and cultures of the wound obtained in the emergency room revealed Klebsiella ornithinolytica, Enterococcus faecalis and Streptococcus anginosus. Blood cultures were taken in the emergency room and the results were negative. 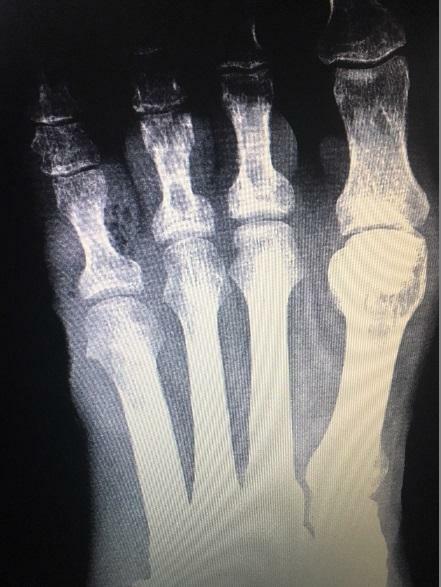 Routine radiographs performed at our center showed lucency through the medial base of the residual 5th metatarsal could represent a nondisplaced fracture or residual osteomyelitis within the bone. Also seen was soft tissue air consistent with gas was seen medial to the 4th proximal phalanx. There was no adjacent osseous erosive change to suggest osteomyelitis within the 4th toe (Figure 1). Because of the presence of gas on the x-ray, the plan was to bring the patient the same day to the operating room for resection of 4th ray and incision and drainage of the same area without closure followed by IV antibiotics. Under general anesthesia and with the use of an ankle tourniquet, utilizing a 4-cm racket incision that incorporated the existing lateral surgical incision, the fourth digit was disarticulated at the fourth metatarsophalangeal joint and sent to pathology. Deep tissue cultures were obtained in this area. Necrotic tissue was noted to the plantar aspect, and there was a foul smell noted without purulence. All necrotic tissue was removed and the distal aspect of the fourth metatarsal was freed of all soft tissue attachments and utilizing a sagittal saw, the bone was resected at the mid-shaft of the fourth metatarsal. The resected bone was sent to pathology. The remaining bone of the fourth metatarsal was noted to be firm, and there was no surrounding necrotic tissue. The surrounding areas were probed, and no abscesses were noted. The operative site was copiously lavaged with Betadine-infused saline. Betadine-soaked Iodoform gauze packing was used to fill the void in the 4th metatarsal with a 3cm area remaining opened for drainage. After surgery, he was placed on IV antibiotics that included Zosyn 3.375 gram every 6 hours and Vancomycin 1 gram every 12 hours for the suspected osteomyelitis. Pathologically, the examination revealed acute osteomyelitis of the toe and metatarsal head with the bone margin free from osteomyelitis and the soft tissue margins of amputation were free from acute inflammation. Cultures taken intra-operatively displayed Klebsiella ornithinolytica [1,2,3,4,5,6,7,8] which was susceptible to Zosyn. For the next 6 days, the patient stayed as an in-patient without complications while the pain diminished, constitutional symptoms of infection disappeared and WBC improved to 8.8. 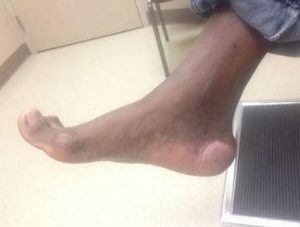 He was discharged after 6 days and sent home on Augmentin for two weeks and seen as an outpatient in the podiatry clinic. Over the next 6 weeks, the patient had no local or constitutional signs of infection while the incision site closed. Raoultella ornithinolytica (formerly Klebsiella ornithinolytica) is a Gram-negative aerobic bacillus which belongs to the family Enterobacteriaceae. However, human infections caused by bacteria of the genus Raoultella are uncommon. A search of the available literature shows only a handful of documented infections with this presentation. It is likely due to the patient’s history of poorly controlled diabetes, with a history of cocaine and continued tobacco use, that caused a compromise to his immune system. Due to the dusky appearance of his fourth digit as well as gas on the radiographs, it was medically necessary for a partial ray resection of the fourth metatarsal. After the operative procedure, the patient was started on IV vancomycin and IV Zosyn. After cultures returned patient was switched to Augmentin. We have described an unusual presentation of bony involvement with soft tissue gas which was a result of an unusual organism. Though infection is rare, Raoultella ornithinolytica can cause significant and possibly limb and life-threatening infection. As previously stated there are only a handful of cases where this level of destruction has been noted due to this particular organism. It is important as clinicians to remember that patients who have an immunocompromised status may encounter organisms that are out of the ordinary and may require increased care. Even though this organism is rare the treatment for the resulting gas gangrene is straightforward. We are fortunate that this patient presented to the emergency department when he did. We establish a definitive treatment plan in order to prevent a more aggressive amputation. 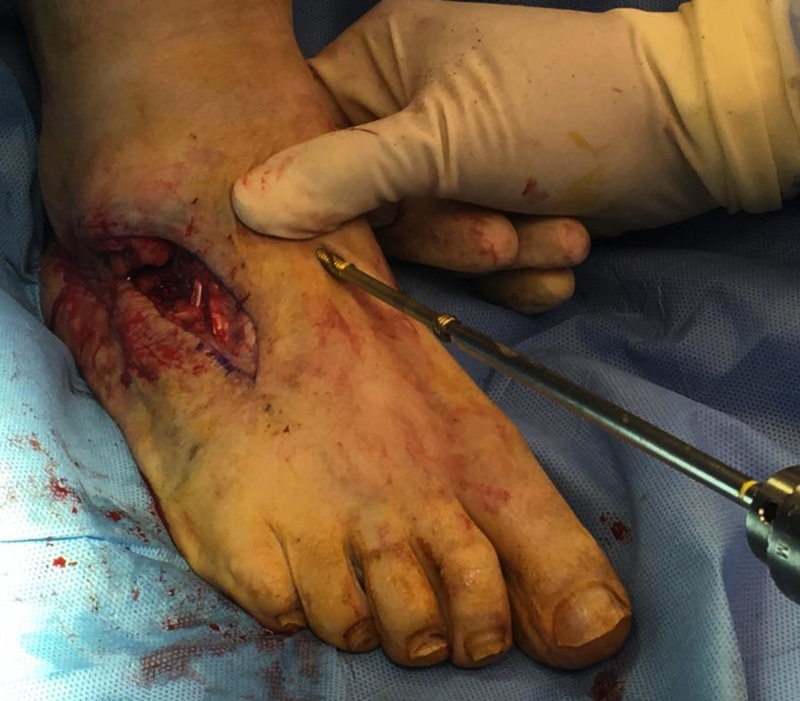 Unfortunately, do to the sequela of this procedure the patient was left with an unstable forefoot which ultimately led to a transmetatarsal amputation. 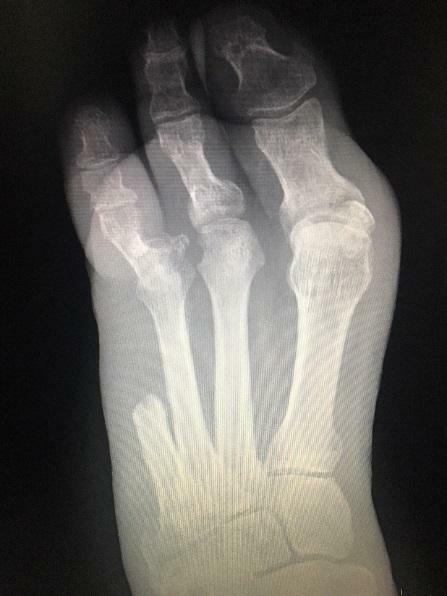 The transmetatarsal amputation site healed uneventfully. Walckenaer E, Poirel L, Leflon-Guibout V, et al. Genetic and Biochemical Characterization of the chromosomal class A β-lactamases of Raoultella (formerly Klebsiella) planticola and Raoutella ornithinolytica. Antimicrob Agents Chemother. 2004;48(1):305–312. Kanki M, Yoda T, Tsukamoto T, Shibata T. Klebseilla pneumoniae produces no histamine: Raoutella plantico and Raoutella ornithinolytica strains are histamine producers. Appl Environ Microbiol. 2002;68(7):3462–3466. Ferran M, Yébenes M. Flushing associated with scombroid fish poisoning. Dermatol Online J. 2006;12:15. Morais VP, Daporta MT, Bao AF, Campello MG, Andrés GQ. Enteric fever-like syndrome caused by Raoultella ornithinolytica (Klebsiella ornithinolytica) J Clin Microbiol. 2009;47(3):868–869. Solak Y, Gul EE, Atalay H, Genc N, Tonbul HZ. A rare human infection of Raoultella ornithinolytica in a diabetic foot lesion. Ann. Saudi Med. 2011;31(1):93–94. Hadano Y, Tsukahara M, Ito K, Suzuki J, Kawamura I, Kurai H. Roultella ornithinolytica bacteremia in cancer patients: report of three cases. Intern Med. 2012;51(22):3193–3195. Hostacká A, Klokocníková Antibiotic susceptibility, serum response and surface properties of Klebsiella species. Microbios. 2001;104:115–124. Hoshide RR, Chung H, Tokeshi J. Emergence of community-acquired extended-spectrum beta-lactamase Escherichia coli (ESBLEC) in Honolulu: A case series of three individuals with community-acquired ESBLEC bacteriuria. Hawaii Med J. 2011;70(9):193–195. Navicular dislocation is a rare injury, typically managed by surgical fixation. 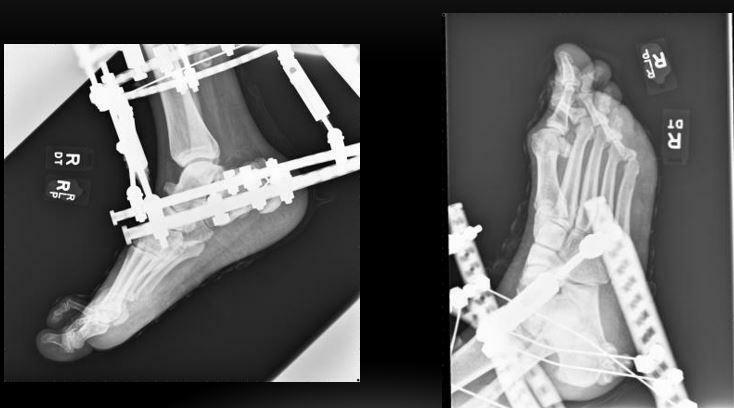 This case study presents the results of conservative management of navicular dislocation, using a custom foot orthosis, combined with a removable walker boot. At 6 week review the numeric pain rating scale (NRS-11) score was reduced from 8/10 to 3/10. A foot orthosis combined with a removable walker boot may reduce pain in the short term in non-operable navicular dislocation more successfully than a walker boot alone. 1 – Roehampton Rehabilitation Centre, Queen Mary’s Hospital. St George’s University Hospitals NHS Foundation Trust; Opcare, Oxfordshire, UK. Dislocation of the navicular without fracture is a rare injury [1-3]. A 2015 case study by Singh and colleagues found 16 previously reported cases in the literature . A further case study was published in 2016 . Two other published cases were not identified which gives a total estimate of 20 published cases in the literature to date [4,5]. The mechanics of injury are commonly described as involving pronation, with abduction of the forefoot . Davis and colleagues describe a transient midtarsal dislocation which allows the navicular to dislocate . The navicular may displace in a plantar or dorsal direction, depending on the nature of the injury. Dhillon and Nagi argue that the injury is never truly an isolated injury as disruption to both the medial and lateral columns of the foot is necessary . Surgical management is usually recommended, typically with temporary Kirschner wire fixation, although other means of fixation may be used [1-3]. Custom foot orthoses have been suggested as a possible treatment option for surgically corrected cases of navicular dislocation which remain painful however there are no reported cases of purely conservative management of navicular dislocation of which the author is aware . This case report presents a navicular dislocation managed purely conservatively using orthoses due to surgical risk factors which made the subject a poor candidate for surgery. A 67-year-old male was referred to see an orthotist in the orthotic service by his orthopedic foot and ankle consultant. The subject had an injury to his left foot 5 months previously sustained during a fall which occurred whilst walking indoors. Initial radiographs and computed tomography scans following the fall show a dislocated navicular and cuboid fracture (Figures 1-4). One month post injury radiographs showed reduced 11 degree calcaneal inclination angle on the left (affected) side compared to 24 degrees on the right, reflecting a reduction in height of the medial longitudinal arch. 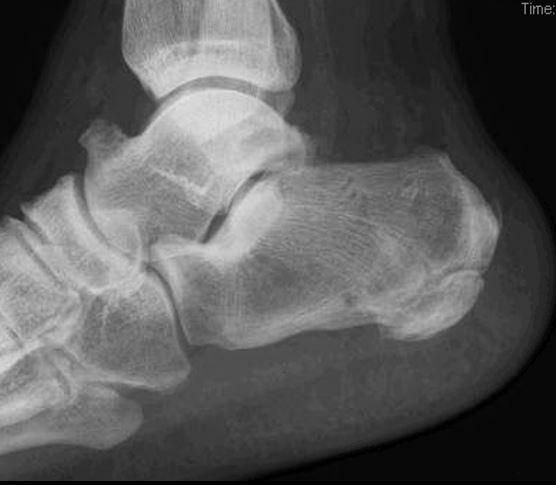 Figure 1 Dislocated navicular resting inferior to the sustentaculum tali. 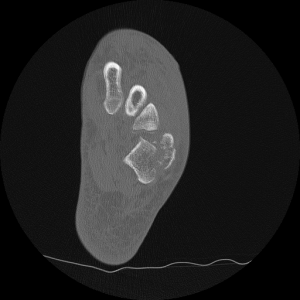 Figure 2 Dislocated navicular resting inferior to the sustentaculum tali. 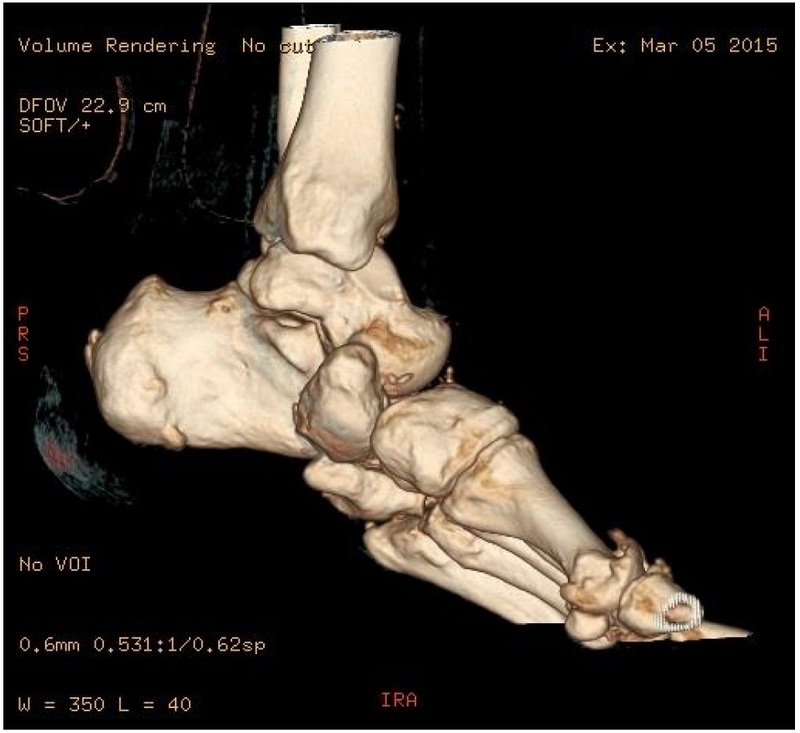 Figure 4 Three dimensional CT reconstruction showing dislocated navicular. A significant factor in the injury was the subject’s body weight which at 2 months following the injury was 161kg (Body Mass Index 50). At the time of assessment in orthotic clinic 3 months later, this had increased to 189kg (Body Mass Index 56). The increased body weight will have increased the ground reaction forces experienced by the foot, and the resultant internal stresses on tissues such as ligamentous tissue which normally help to maintain joint congruency [7,8]. Following two orthopedic opinions, and assessment in a high risk anesthetic clinic, it was agreed to avoid surgery due to the high risk of mortality. It was observed that the talar head was now articulating with the medial cuneiform, forming a pseudo joint. At presentation in orthotic clinic the subject reported pain as the primary concern. His walking was very limited to short distances indoors, wearing a removable walker boot (Aircast Airselect, Donjoy). He reported pain at an intensity of up to 8 out of 10 (numeric rating scale, NRS-11). A custom ankle foot orthosis (AFO) was considered to limit painful movement within the foot, however this was decided to not be feasible as the subject would struggle to apply or remove this independently . A custom foot orthosis (FO) was prescribed to wear inside the walker boot. The mechanical aim of this was to apply forces to the medial longitudinal arch in an attempt to modify compressive stresses assumed to be occurring at the midfoot and talo-cuneiform pseudo-joint, and tensile stresses assumed to be occurring in soft tissues at the plantar foot . The FO was made from an imprint of the foot in a foam impression box using a computer aided design and manufacture (CAD-CAM) system (Paromed, Neubeuern, Germany). The FO was manufactured using 70 shore material at the heel to midfoot, and softer 50 shore material from the midfoot to the forefoot. A soft 3.2mm grey poron polyurethane foam cover (Algeos, Liverpool, UK) was added. The shape of the FO is demonstrated by the modeling images (Figure 5a-d). Figure 5 Custom foot orthosis, medial view (a), lateral view (b), anterior view (c), dorsoplantar view (d). At 6 week review the subject reported good compliance with wearing the FO within the walker boot. Using the 11 point numeric pain rating scale (NRS-11), pain intensity during walking was reported to be reduced from 8/10 to 3/10. This case study presents the results of conservative management of an unusual foot injury. A custom FO, combined with a walker boot, reduced pain intensity in the short term. Pain was still present while using the walker boot only. 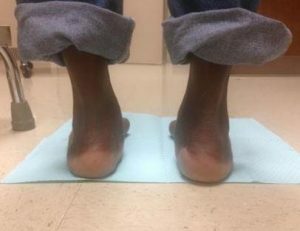 The reported reduction in pain following addition of the FO may imply that the FO was able to modify stresses in the midfoot, even in the presence of very high body weight, in order to be effective. 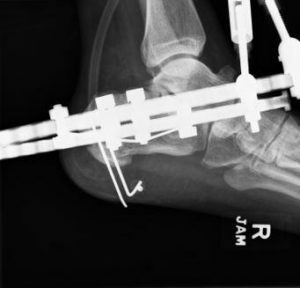 FOs are rarely used for this specific application due to the rarity of the injury, however they may be combined with walker boots to manage Charcot foot which is also associated with major change of the midfoot architecture. Limitations of this study include a lack of further outcome measures, and possible bias incurred by the treating clinician administering the NRS-11 pain scale. This case study illustrates the possibility that even major changes in the bony structure of the foot, which are symptomatic, may be manageable to some extent conservatively using foot orthoses. The author would like to acknowledge Dominic Nielsen, consultant orthopaedic surgeon, for his comments on the paper. Ansari MAQ. 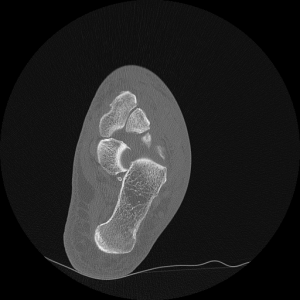 Isolated complete dislocation of the tarsal navicular without fracture: A rare injury. Ci Ji Yi Xue Za Zhi. 2016;28(3):128-131. Singh VK, Kashyap A, Vargaonkar G, Kumar R. An isolated dorso-medial dislocation of navicular bone: A case report. J Clin Orthop Trauma. 2015;6(1):36-8. Davis AT, Dann A, Kuldjanov D. Complete medial dislocation of the tarsal navicular without fracture: report of a rare injury. J Foot Ankle Surg. 2013;52(3):393-6. Hamdi K, Hazem BG, Yadh Z, Faouzi A. Isolated dorsal dislocation of the tarsal naviculum. Indian J Orthop. 2015;49(6):676-9. Dhillon MS, Nagi ON. Total dislocations of the navicular: are they ever isolated injuries?. J Bone Joint Surg Br. 1999;81(5):881-5. Browning RC, Kram R. Effects of obesity on the biomechanics of walking at different speeds. Med Sci Sports Exerc. 2007;39(9):1632-41. Pamukoff DN, Lewek MD, Blackburn JT. Greater vertical loading rate in obese compared to normal weight young adults. Clin Biomech (Bristol, Avon). 2016;33:61-65.
International standards organization. ISO 8549-3, Prosthetics and orthotics – Vocabulary – Part 3: Terms relating to external orthoses. 1989. Intramedullary rod fixation is presented as a viable treatment option for distal fibular fractures in the geriatric population. This technique leads to a reduction in wound complications, hardware irritation, procedure time and need for subsequent surgeries as seen with traditional open reduction internal fixation for distal fibular fractures in higher-risk patients. Geriatric patients are at an increased risk for sustaining ankle fractures due to increased fall rate and decreased bone density. Surgical repair for such injuries is often complex, due to the standard large incision and relatively bulky fixation which is necessary in the geriatric patient due to their generally poor bone stock . This traditional form of fixation carries a complication rate of up to 30% . Additionally, wound healing complications and hardware irritation is more common in this population due to a poor soft tissue envelope, with wound infection rates ranging from 26-40% . Commonly, subsequent surgeries are necessary to remove hardware or to perform wound debridements . As it is well documented that surgical morbidity increases in this population, it is important to utilize techniques and fixation methods that limit subsequent encounters. In this case report, we present intramedullary fixation for distal fibular fractures as a viable option for the geriatric population. The patient is a 94-year-old male who presented 5 days after a fall with a Weber B, slightly comminuted, left distal fibular fracture (Figure 1a). Due to the unstable nature and slight displacement of the fracture, surgical intervention with an intramedullary fibular rod was chosen. Intra-operatively under general anesthesia, excellent anatomic reduction was noted after placement of the rod and one syndesmotic screw (Figure 1b). At 2 weeks postoperatively, the posterior splint and skin staples were removed. The patient transitioned to protected heel touch weight-bearing for 4 weeks. He resumed regular activity and normal shoe wear at 6 weeks postoperatively. There were no wound healing complications or hardware irritation noted throughout the postoperative course. At 12 months follow up, patient reported no ankle pain or limitations in activities of daily living (Figures 2a-b). 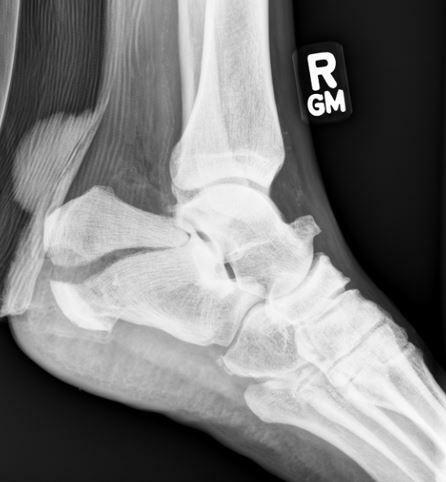 Figure 1 AP ankle radiograph showing Weber B fracture with slight comminution and displacement (a). 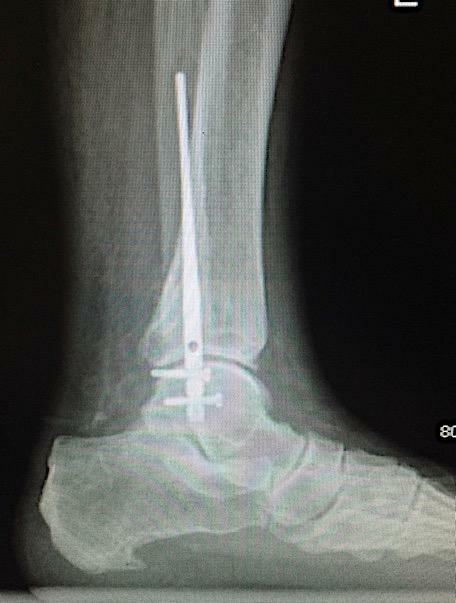 Two weeks postoperative AP radiograph showing excellent anatomic reduction with fibular rod and syndesmotic screw (b). Figure 2 Twelve months post operative AP (a) and lateral (b) radiographs showing excellent bony consolidation of fracture fragments and adequate anatomic reduction. Treatment of distal fibular fractures in geriatric patients have an increased risk for postoperative complications which can lead to wound healing issues and subsequent surgeries. It is important to utilize techniques and fixation methods that limit subsequent encounters in order to decrease surgical morbidity in this cohort. The intramedullary fibular rod is an excellent alternative to traditional ORIF in the geriatric population. Our case example demonstrates an ideal patient for this technique, including successful anatomic realignment and uneventful postoperative course. 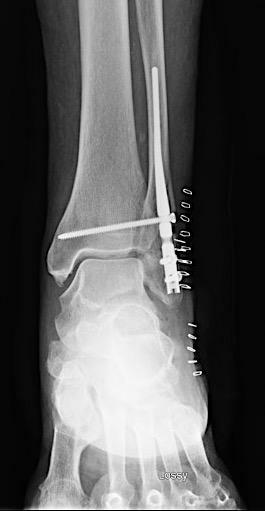 Mitchell JJ, Bailey JR, Bozzio AE, Fader RR, Mauffrey C. Fixation of distal fibula fractures: an update. Foot Ankle Int. 2014;35(12):1367-1375. Höiness P, Engebretsen L, Stromsoe K. The influence of perioperative soft tissue complications on the clinical outcome in surgically treated ankle fractures. Foot Ankle Int. 2001;22(8):642-648. Lee YS, Huang HL, Lo TY, Huang CR. Lateral fixation of AO type-B2 ankle fractures in the elderly: the Knowles pin versus the plate. Int Orthop 2007;31:817–821. The triple arthrodesis surgical approach typically involves two incisions placed laterally and medially to obtain access to the subtalar joint (STJ), talonavicular joint (TN), and the calcaneocuboid joint (CC). Despite the wide use of the two-incision approach, the traditional approach for triple arthrodesis has been described with a single lateral incision from the tip of the fibula across the sinus tarsi to the talonavicular joint, documented historically by Ollier. The operative technique is described, 14 patients met the inclusion criteria, with a mean age of 50 (range 16-68). The most common diagnosis was posterior tibial tendon dysfunction (PTTD) (71%). Two (14.2%) required revisional operations: one developed a metal allergy and required hardware removal with soft tissue debridement and skin grafting all after achieving bony healing (7.1%), one developed a rearfoot varus requiring a dwyer calcaneal osteotomy (7.1%). The union rate of each joint was 100% in the STJ, 100% in the TN joint, and 92.9% in the CC joint at 6 months post-operatively. The retrospective mean VAS pain score pre-operatively was 83, while the post-operative score was 42. The mean preoperative Talonavicular angle, Meary’s angle and Calcaneal pitch angle were 4.2; 4.8 and 15.2 respectively. The Immediate post-operative angles of each angle were 2.5; 1.2 and 22.5 respectively. At six months follow up, these angles were 2.6; 1.2 and 18 respectively. The triple arthrodesis is a widely accepted surgical method for treating complex rearfoot deformity and arthritis. The surgical approach typically involves two incisions placed laterally and medially in order to grant access to the subtalar joint (STJ), talonavicular joint (TN) and the calcaneocuboid joint (CC) . Despite the wide use of the two-incision approach, the traditional approach for triple arthrodesis has been described with a single lateral incision from the tip of the fibula across the sinus tarsi to the talonavicular joint, documented historically by Ollier . The triple arthrodesis is indicated in conditions such as post-traumatic arthritis, tarsal coalition, congenital deformities, neuromuscular deformities and end stage arthritis . As the accepted gold standard for treating these problems, the procedure has since been modified and adapted in more recent years . While adhering to the principles of fixation, modified approaches have been adapted which still allow for proper exposure and preparation of the joints. Appropriate alignment of the joints is paramount if a good result is to be achieved. The single incision approach has been described in literature from a single incision medial approach for triple arthrodesis and double arthrodesis with some success . We hypothesized that correction would be able to be achieved and maintained through one lateral incision approach for triple arthrodesis. The aim of the retrospective study was to evaluate the complications and results of triple arthrodesis performed using a single lateral incision and to measure radiographic changes over a period of six months. Medical records were reviewed of all patients that underwent a triple arthrodesis with a single lateral incision, performed by one surgeon from January 2008 until February 2016. Patients were excluded from the study if they had less than six months of follow up, if medical documentation was incomplete, and if external fixation was used during the initial surgery. Data obtained retrospectively from chart review included patients’ age, gender, preoperative diagnosis, total surgical time, complications, and adjunctive surgeries that were performed. 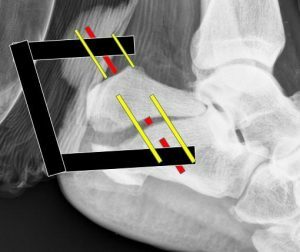 Pre- and postoperative radiographic measurements of talonavicular angle, Meary’s angle and calcaneal pitch angle were collected and calculated. All surgeries were performed by one physician (MM). A preoperative and postoperative score for pain was obtained by VAS scale (Visual Analog Scale for Pain) via phone survey. Analysis was then conducted to calculate operative time. The patient is positioned on the operative table in the supine position with a pre-fashioned bump placed under the operative hip as deemed necessary. A thigh tourniquet is placed. The single incision is then utilized from the distal portion of the fibula over the sinus tarsi to the base of the 4th metatarsal on the operative foot (Figure 1). 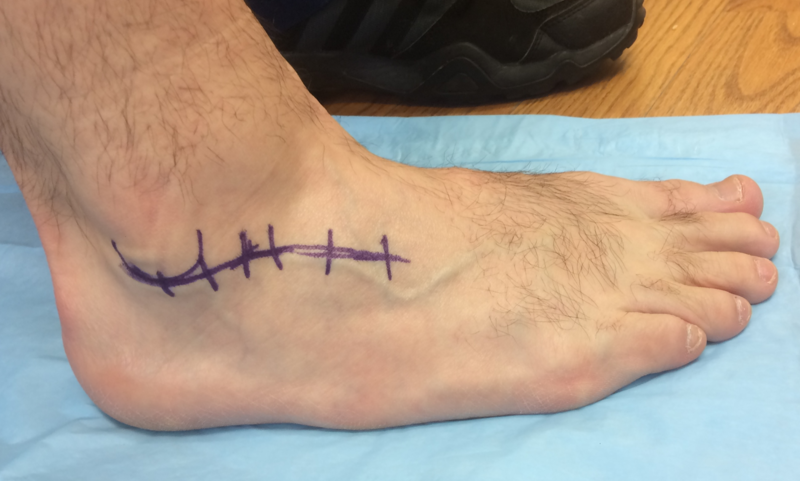 Figure 1 Incision placement for the single lateral incision triple arthrodesis extending from just below the lateral malleolus extending across the sinus tarsi to the base of the 4th metatarsal. Figure 2 Dissection and exposure for the single lateral incision for triple arthrodesis. The sinus tarsi can be located by inserting a needle into the sinus tarsi prior to drawing out the incision. At the distal most portion of the surgical approach, the extensor digitorum brevis is identified and split longitudinally to gain exposure to the calcaneocuboid joint. Next, the interosseous ligament within the sinus tarsi is resected and any subcutaneous tissue is removed. Careful dissection is continued to level of the talonavicular joint, where a combination of elevators and positioning of the foot allows for release of capsular tissues (Figure 2). Using curettes, round burr, and curved osteotomes; articular cartilage is carefully resection from the CC and ST joints. Figure 3 Exposure of the talonavicular joint and subtalar joints visualized with a pin distractor through a single lateral incision. Figure 4 Distraction and preparation of the calcaneocuboid joint with a pin distractor. A cervical spine distractor is utilized to aid in preparation of these joints (Figures 3 and 4). This process is then repeated to expose and prepare the TN joint, while carefully maintaining anatomical alignment of the joint. The joints are then further prepared using a 2.0 mm drill bit to fenestrate each joint. Temporary fixation is utilized and permanent fixation is achieved with one or two 7.0 mm cannulated screws to fuse the STJ followed by two 5.5 mm screws to fuse the TN joint (Figure 5). The CC joint is evaluated and fused using one or two staples. Figure 5 Percutaneous fixation of the talonavicular joint. 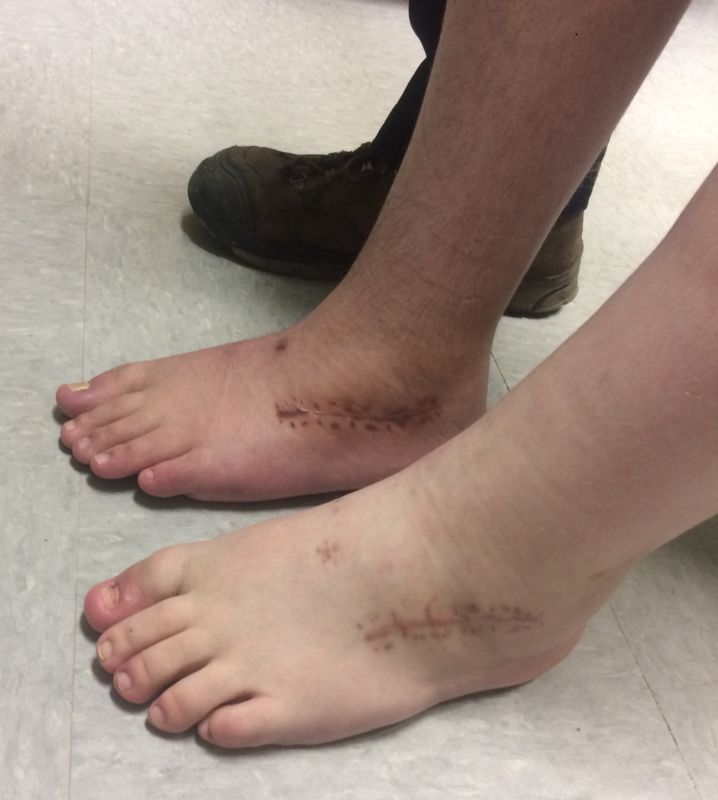 Figure 6 Post-operative scars of two brothers, both with posterior facet tarsal coalitions, now status-post triple arthrodeses performed with the single lateral incision. Closure is performed in layers. A Jackson-Pratt drain is placed. The Silfverskiold test is performed after arthrodesis to evaluate the need for tendo-Achilles lengthening or gastrocnemius recession. These procedures are performed concomitantly as deemed necessary by the surgeon. Figure 7 Pre-operative and Post-operative films status-post triple arthrodesis through a single lateral incision. The patient is placed into a posterior splint and Jones compression dressing for the first week after surgery. At the first follow up visit at one week, the patient is placed into a below knee cast for three additional weeks. At the fourth postoperative week, the cast is removed and the patient is placed into a removable walking boot. Over the course of week 5 and week 6, gradual weight bearing is increased until the patient is fully weight bearing in the boot by the end of the sixth week (Figures 6 and 7). 14 patients met the inclusion criteria, 5 males (35.7%) and 9 females (64.3%) with a mean age of 50 (range 16-68). The average BMI of the group was 34.1(range 19.6-48.7). The most common diagnosis of the patients operated on in this study was posterior tibial tendon dysfunction (PTTD) (71%). The mean operating time of the single incision triple arthrodesis was 90 minutes (range 60-135 minutes). Of the 14 patients included in this study, two (14.2%) required revisional operations. One patient developed an unforeseen metal allergy and required hardware removal with soft tissue debridement and skin grafting all after achieving bony healing (7.1%). The other patient developed a postoperative rearfoot varus deformity and returned to the operating room for a dwyer calcaneal osteotomy (7.1%). One patient (7.1%) developed a non-union of the CC joint which was asymptomatic. The union rate of each joint was 100% in the STJ, 100% in the TN joint, and 92.9% in the CC joint at 6 months post-operatively. The retrospective mean VAS pain score pre-operatively was 83, while the post-operative score was 42. The mean preoperative Talonavicular angle, Meary’s angle and Calcaneal pitch angle were 4.2; 4.8 and 15.2 respectively. The Immediate post-operative angles of each angle were 2.5; 1.2 and 22.5 respectively. At six months follow up, these angles were 2.6; 1.2 and 18 respectively. After analysis using the unpaired t-test, the P-values were demonstrated in table 4. Values of less than 5% (p < 0.05) were considered statistically significant. All surgical corrections as measured with the three angles listed were found to be statistically significant in the immediate post-operative period. At 6-months follow up, the only measurement that was found to not be statistically significant was the calcaneal pitch angle correction. Triple arthrodesis incision planning has been described very seldom in literature. In the study by Moore in 2014, a comparison was made between two groups of patients in which triple arthrodesis was attempted via one incision vs two . The study showed that while there may not have been statistically significant differences between the two groups in regard to union rates; a similar result could be achieved in a more efficient amount of operating time. They also proved that the TN joint could be accessed and prepared properly through a lateral incision. In a study by Bono and Jacobs evaluating triple arthrodesis performed through one lateral incision, the union rate of each joint was 80% in the STJ, 90% in the CC joint and merely 38% in the TN joint . The authors of this study concluded that a triple arthrodesis could not be effectively achieved through one lateral incision. Despite the dependable and reproducible nature of arthrodesis, the disruption of soft tissue and ligamentous stability of the bones has been shown to cause complications. These complications include wound dehiscence, delayed union, nonunion, re-operation and operating time. These complications as well as the benefits of decreased operating times were well described by Weinraub in their study in 2010 . The study also took into consideration the addition of the fiscal benefits of decreasing cost by decreasing operating time. Similar complications were also found in our study as demonstrated by our complication rate. The comparisons of our study, while the focus is on radiographic measurements and patient satisfaction scores, help to build on these previous studies by producing repeatable and measurable results through the single incision. While joint preparation and visualization can prove to be more arduous from a lateral incision, this approach has been demonstrated in the past to be successful. Limiting the amount of surgical incisions that need to heal can help to improve time of recovery in patients that may have poor soft tissue envelope. Despite the lack of some assessment on clinical outcomes, the radiographic data that was obtained by this study demonstrated that surgical correction can be made and maintained by using one lateral incision for triple arthrodesis. The limitations of the case study were its retrospective and non-randomized nature. There was also no control group for comparison. While the data collected centered around radiographic measurements and patient VAS scores as a representation of the outcome, there was a lack of clinical assessment of a valid outcome in the study. The study was also limited by the lack of a long term follow up group for measurement and comparison of data. Potential considerations for future research include a comparison group of single incision vs. double incision patients of similar demographics. Table 1 Patient Demographics (N=14 operations in 13 patients). Abbreviations: BMI: Body mass index; PMH: Past medical history; PTTD: posterior tibial tendon dysfunction; ppd: Packs per day; HLD: hyperlipidemia; CA: Cancer; CVA: Cerebrovascular accident, I and D: Incision and Drainage; HWR: Hardware removal. Table 3 Summary of Radiographic Measurements (Degrees). A: Talonavicular angle, B: Meary’s Angle, C: Calcaneal Pitch Angle. Table 4 Summary of P-values Post Operatively. Myerson MS. Triple Arthrodesis. Reconstructive Foot and Ankle Surgery, Ed 2. Edited by MS Myerson, Elsevier Saunders, Philadelphia, 2011. McGlamry D, Ruch J, Mahan K, Napoli D. Triple Arthrodesis. Podiatry Institute Update. 1987. Ch 30. Geocker RM, Ruch JA. Triple arthrodesis. In McGlamry’s Comprehensive Textbook of Foot and Ankle Surgery, Ed 3. Edited by AS Banks, MS Downey, DE Martin, SJ Miller, Lippincott Williams and Wilkins, Philadelphia, 2001. Weinraub GM, Schuberth JM, Leem, Rush S, Ford L, Neufield J, Yu J. Isolated medial incisional approach to subtalar and talonavicular arthrodesis. J Foot and Ankle Surg 2010; Vol. 49: 236-330. Jeng C, MD, Tankson C., Myerson, MD. The Single Medial Approach to Triple Arthrodesis: A Cadaveric Study. Foot & Ankle Int 2006. Vol 27 (12). Blake E. Moore, MD, Nathaniel C. Wingert, MD, Kaan S. Irgit, MD, Christian J. Gaffney, MD, and Gerard J. Cush, MD. Single-Incision Lateral Approach for Triple Arthrodesis. Foot & Ankle Int 2014. Vol. 35: 896 –902. Bono JV, Jacobs RL. Triple arthrodesis through a single lateral approach: a cadaveric experiment. Foot Ankle. 1992. Vol. 13: 408-412. Berlet G, Hyer C, Scott R, Galli M. Medial Double arthrodesis with lateral column sparing arthrodiastasis: A radiographic and medical record review. J Foot and Ankle Surg 2015. Vol. 54: 441-444. Sammarco VJ, Magur EG, Sammarco GJ, Bagwe MR. Arthrodesis of the subtalar and talonavicular joints for correction of symptomatic hindfoot malalignment. Foot and Ankle Int. 2006. Vol. 27: 661-666. Complex regional pain syndrome (CRPS) is a debilitating disorder characterized by widespread, chronic pain. While elective procedures should be held until acute CRPS flare ups have subsided, certain scenarios require immediate surgical care. Surgical management of patients with CRPS requires a team approach with several other specialties including pain management and anesthesiology. In this article, we outline a pre-operative and post-operative management course for lower extremity surgery of patients with diagnosed CRPS. We also present several case reports where this protocol was utilized. 1 – Second year podiatric surgery resident at Beaumont Hospital, Wayne. 2 – Program director for podiatric surgery at Beaumont Hospital, Wayne. Physicians have been documenting disorders of chronic pain for centuries, with earliest documentation spanning back to Ambroise Pare’s description of chronic pain with King Charles IX in the 17th century . Mitchell and colleagues documented cases of chronic pain in soldiers secondary to gunshot wounds and injuries of peripheral nerves during the Civil War . Complex regional pain syndrome (CRPS) has historically been known by multiple names including reflex sympathetic dystrophy, causalgia, Sudeck’s atrophy, and shoulder-hand syndrome. Most experts now abide by terminology introduced by the International Association for Study of Pain (IASP) in 1994, which subdivided CRPS into type 1 and type 2, with type 2 having an inciting nerve injury . The diagnosis of CRPS is based on clinical findings. The original IASP diagnostic criteria for CRPS includes: 1) The presence of an initiating noxious event or a cause of immobilization. 2) Continuing pain, allodynia, or hyperalgesia with which the pain is disproportionate to any inciting event. 3) Evidence at some time of edema, changes in skin blood flow, or abnormal sudomotor activity in the region of pain. 4) This diagnosis is excluded by the existence of conditions that would otherwise account for the degree of pain and dysfunction . More recent literature from the Reflex Sympathetic Dystrophy Association unveiled a clinical diagnostic criteria update, which reflects systemic findings that can be documented during patient visits (Table 1). Current management for active CRPS includes physical therapy, antidepressant agents, gabapentin, corticosteroids, topical analgesics, opioids, sympathetic blocks, somatic blocks, and neuromodulation [6-10]. Table 1 Clinical diagnostic criteria for complex regional pain syndrome. In recent pain management literature, low dose naltrexone (LDN) has been shown to be efficacious in treating patients with CRPS . LDN refers to doses approximately 50-fold lower than doses of naltrexone typically given to patients addicted to opioids . It has been shown that LDN antagonizes the Toll-like receptor 4 (TLR 4) pathway and attenuate microglia. TLR 4 in both CNS neurons and microglia augments the production of pro-inflammatory cytokines via the nuclear factor kappa-light-chain-enhancer of activated B cells (NF- κB) pathway, which acts as a mediator for neuropathic pain . In a double blind study of 30 women with chronic pain, twice daily administrations of 4.5 mg of Naltrexone resulted in 57% of the participants exhibiting a significant reduction in pain when compared to placebo . The current paradigm of surgeons has been to avoid operating on patients with CRPS because symptoms could either recur or worsen. In 6-10% of patients, surgical intervention is warranted and should not be delayed. These conditions include painful deformity, displacement of fixation, fracture, trauma, tumors, and soft tissue masses . Surgical management of patients with CRPS has been documented in orthopedic literature, with several papers discussing surgical intervention of the upper extremity and the knee [16,17]. Previous recommendations in the knee included waiting 5 months, with ranges from 2 months to 1 year. Prolonging surgery allows for subsidence of acute pain, as well as allowing time for treatment such as sympathetic blocks and physical therapy [16,17]. The purpose of this article is to outline a surgical management approach preoperatively and postoperatively for patients with active CRPS to provide the podiatric surgeon with management options, as well as review three cases in which this protocol was used. Surgical management of patients with CRPS requires a team approach. It is imperative to coordinate with the physician who is actively managing the patient’s CRPS. If a patient does not have an active pain management specialist, consultation with a pain management specialist should be sought prior to operating. The surgeon should coordinate with the pain management physician as well as anesthesiologist regarding patient’s operative management course with clear understanding of preoperative and postoperative treatment. Recent literature has found that low dose naltrexone (LDN) has been shown to be efficacious in treating patients with CRPS through its endorphin releasing and anti-inflammatory properties. However, it should be held at least 24-36 hours before surgery to ensure that opiate medication administered from anesthesia is able to reach full efficacy. Anesthesia choice is critical in ensuring that CRPS flare-ups or increase in symptoms of active CRPS do not occur. Either epidural or spinal anesthesia should be utilized in patients with CRPS. This practice has been documented in orthopedic literature with studies showing recurrence rates of CRPS falling from 72% to 10% with the use of a preoperative spinal or epidural block . It is believed that this may provide a clinical advantage by blocking the potential barrage of nociceptive afferent signals in the central nervous system during surgery . When trying to evaluate whether epidural or spinal anesthesia should be performed, several variables should be considered such as time from start of induction to achievement of anesthesia, time for resolution of anesthesia, and possible side effects. In spinal anesthesia, the average time from intrathecal injection of local anesthetic to achievement of surgical anesthesia is 13 minutes in conventional spinal and 16 minutes in unilateral spinal . In epidural anesthesia with insertion of catheter, the average time to achieve induction was noted to be 40 minutes . When performing spinal anesthesia with 5 mg hypobaric bupivacaine, Ben-David reported two segment regression after 53 minutes and discharge after 180-190 minutes, with newer studies stating average PACU time following completion of procedure ranging between 65-98 minutes [21, 22]. Mulroy noted average PACU time for patients who received epidural prior to knee surgery as 92 ±18 minutes . Epidural allows for the titration of short term local anesthetic which may lead to quicker discharge times following outpatient procedure, while still providing blockade to prevent CRPS flare-ups. In patients with CRPS, epidural catheter allows the option for continuous titration of anesthetic, which may be beneficial following the procedure, whereas spinal anesthesia employs a single dosage of anesthetic. Common side effects noted in both spinal and epidural anesthesia are hypotension, bradycardia, post-dural puncture headaches, nausea, and vomiting. In more severe side effects, prolonged neurological complications have been observed. In epidural anesthesia, urinary retention is also a common side effect, which may require catheterization and hospitalization. Following the surgical procedure, patients are admitted for 24-48 hours of IV pain medication administration. Patients are given take-home oral analgesic medication for pain relief until acute surgical pain has subsided. Typical examples of oral medications include Percocet 10 mg/325 mg, 1-2 tablets by mouth every 4-6 hours, or Hydromorphone 2-4 mg, 1 tablet by mouth every 4-6 hours. If patients were previously taking LDN, they are to resume daily LDN when surgical pain is controlled and after 7 days have elapsed. We recommend early range of motion and aggressive physical therapy following procedure once the surgical site is stable. If symptoms of CRPS appear to be exacerbated following surgery, we recommend patients undergo intravenous Ketamine infusion therapy, under the management of their pain specialist. A 38-year-old male presented to our clinic one month after injuring his right foot when a 1000-pound roll of vinyl fell onto his foot. 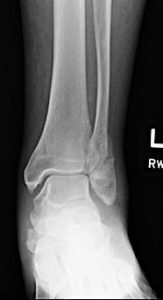 The patient was initially referred to our clinic for care of a nondisplaced fracture of the fifth metatarsal; however, radiographs and bone scan failed to reveal signs of fracture and a diagnosis of contusion to the right foot was made. The patient had been immobilized in a nonweightbearing below knee cast for one month and had subsequently developed increased pain out of proportion to injury as well as exhibited mottling of skin to dorsum of right foot in relation to left. The patient also began to exhibit rigid contractures of the right tibialis anterior, extensor digitorum longus, and extensor hallucis longus. The patient was referred to a pain management specialist where the diagnosis of CRPS to the right lower extremity was made. The patient reported that since date of injury, the pain had progressively increased and at time of initial presentation, was so severe that even light touch to the right lower extremity was excruciatingly painful. On evaluation it was determined that the patient exhibited two distinct types of pain, a generalized CRPS pain to the affected lower extremity as well as a muscular pain secondary to rigid contractures. The patient was treated in our office monthly for peripheral nerve blocks at the level of the ankle joint consisting of 0.5% Marcaine plain, which the patient reported provided several hours of relief of contractures and pain before pain and contractures returned. At the same time, he underwent 22 sympathetic blockades over the course of 3 years from 4 different pain clinics, but had no relief, despite multiple pain management treatment modality attempts including a spinal cord stimulator. The patient was treated noninvasively by pain management specialists as well as our clinic for approximately 3 years, at which time it was determined that pain level had plateaued and was not improving with the treatment. The patient underwent three different manipulations of the right foot under epidural anesthesia. The extensor tendons were stretched for a period of 20 minutes, until relaxation of rigidly contracted muscles were noted. The patient was then placed in an anterior splint following the procedures. No acute flare up of CRPS was seen immediately after the procedure; however, the patient exhibited return of rigid contractures and pain 48 hours following each procedure and was unable to tolerate the anterior splint. No increase in CRPS pain was seen following procedures. The patient then underwent a series of botox injections that provided some pain relief and reduction of contracture to right foot and ankle that lasted for approximately two to three weeks before the muscles returned to rigid clonus. Surgical intervention to the right foot was discussed with the patient. The patient was offered procedures that included manipulation of the right foot under anesthesia, capsulotomy of the right first metatarsophalangeal joint, lengthening of the tibialis anterior, extensor hallucis longus, and extensor digitorum longus tendons, and sectioning of extensor hallucis brevis, all of the right foot. The patient was advised that procedure may exacerbate symptoms of CRPS and that no guarantees were given or implied. The patient met with his pain management specialist prior to the procedure and was given provisions for oral analgesics following the procedure. On the day of the procedure, anesthesia was obtained with spinal anesthesia. The patient was placed on the operating table in the supine position. Manipulation of the foot was first performed where attention was made to manually plantarflex the right ankle joint as well as toes 1-5, which were noted to be rigidly contracted in a dorsiflexed position. Following manipulation, the foot was noted to held in a plantarflexed position. Standard z-lengthening procedures were then performed to the extensor digitorum longus, extensor hallucis longus, and tibialis anterior tendons. The extensor hallucis brevis tendon was identified and then sectioned proximal to its insertion. Attention was then directed to the first metatarsophalangeal joint where a dorsal and lateral capsulotomy was then performed and contracture of the first metatarsophalangeal joint was noted to be decreased. Closure was completed using a combination of dissolving and nondissolving suture. A postoperative block was then infiltrated around the incision sites consisting of 9 mL of 0.5% Marcaine plain and 2 mL of dexamethasone. Following the procedure, the patient was admitted for 48-hour pain management. The patient reported a relief in pain following the procedure and was able to tolerate weight bearing to the right lower extremity without the use of an assistive device for the first time since the injury. Ultimately, the patient reported return of CRPS pain and contractures 2 weeks following the procedure; however, no increase in CRPS pain was noted. In addition, the patient noted that contractures to the right lower extremity were not as rigid or painful. A 31-year-old female with history of CRPS type 1 after sustaining multiple injuries from a motor vehicle accident presented to our clinic with complaints of right ankle pain. 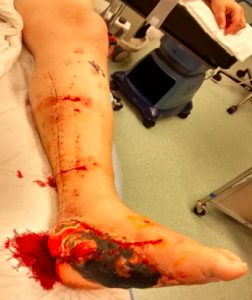 The patient had history of multiple surgeries to her right ankle with internal fixation after suffering a comminuted open right ankle fracture. The patient’s pain was actively cared for by a pain management specialist who had maintained the patients pain in a tolerable level with the use of LDN as well as IV Ketamine infusion therapy. The patient presented to our office with complaints of a painful right ankle, which had subsequently developed a severe valgus alignment of the right heel, subtalar joint arthritis, a nonunion of a right fibular fracture, as well as pain along course of retained hardware. Despite active pain management therapy, the patient admitted to 10/10 pain to the right ankle. The patient related that pain to her right ankle was becoming debilitating to the point that she was unable to ambulate. Initial attempts were made to treat the patient conservatively with the use of padding, bracing, and offloading with patient reporting no relief of pain. When conservative treatment options were exhausted, the patient was advised of surgical correction. The patient was made aware that surgical correction risked the possibility of a CRPS flare-up. She was fully aware of this and wished to proceed with procedure. Prior to boarding procedure, multiple conversations were had with patient’s pain management specialist as well as anesthesia team at our institution with preoperative, perioperative, and postoperative management discussed at length. It was determined that prior to procedure, patient was to hold LDN. The day of the procedure, patient was to obtain a popliteal block prior to induction and then undergo general anesthesia. The patient was then to be admitted for extended stay pain monitoring. Twenty-four hours prior to procedure, patient’s LDN was held. On the day of the procedure, the patient was to undergo a popliteal block prior to induction; however, she did not receive the block prior to procedure. The patient was brought to the operating room and placed on the hospital table in the supine position where general anesthesia was obtained. The patient then underwent removal of painful retained bone screws and plates of the ankle, open reduction and internal fixation of right fibular nonunion, resection of synostosis of right ankle, excision of scar tissue of right ankle, medial transpositional calcaneal osteotomy with internal fixation of right foot, as well as arthrotomy of right ankle. The patient was then placed in a well-padded cast and was instructed to be non-weight bearing to the right lower extremity with the use of crutches. Following the procedure, the patient awoke from anesthesia in intense pain to the surgical limb. An epidural was placed and pain was controlled. The patient was converted to 48 hour full admit due to epidural. After 24 hours, she related that epidural was starting to wear off and was admitting to increased pain to surgical limb. The patient was maintained on IV Dilaudid and oral Percocet, 10 mg. After 4 days postoperatively, her pain was maintained on oral Percocet and patient was discharged home. The patient went on to achieve surgical union of fibular fracture, but continued to admit to CRPS pain to the surgical limb, which limited activities of daily living. The patient related to no increase in CRPS pain. Six months following her procedure, the patient successfully underwent a spinal cord stimulator trial. Following insertion of the stimulator, the patient was able to stand and walk around a department store, which she had been unable to do following the initial accident. Although the patient still relates to CRPS pain, the pain related to her foot and ankle condition has subsided and no increase in CRPS pain has been noted. A 65-year-old female presented to our office with history of CRPS, which she developed following a third intermetatarsal space neurectomy to the left foot. On clinical exam, the patient exhibited symptoms of a neuroma to the second intermetatarsal space to the left foot as well as a stump neuroma to the third intermetatarsal space of the left foot and admitted to 10/10 left pain with maximal tenderness to the forefoot. The patient admitted that pain to the left foot was so intense that her ability to ambulate was becoming limited. Conservative treatment was attempted with offloading, padding, and local steroid injections to the affected intermetatarsal spaces, which provided little to no relief. Once conservative options had failed, surgical intervention was discussed with the patient. The patient was advised that the proposed procedures would be an excision of neuroma to second and third intermetatarsal space of the left foot. The patient was made aware that CRPS symptoms could be exacerbated by the procedure and that clear pain management goals were outlined with her pain management physician. On the day of the surgery, anesthesia was obtained with spinal anesthesia as well as a local anesthetic block to the second and third intermetatarsal spaces of the left foot. Anatomic dissection was carried down to the level of the neuroma and nerve was tracked proximally until healthy nerve tissue was observed. Inflamed nerve was then resected from the second and third intermetatarsal space. A 4 cm x 2 cm x 0.5 cm nerve specimen was excised from the second intermetatarsal space and a 2 cm x 1.5 cm x 0.3 cm nerve specimen was excised from the third interspace. Closure was then performed with a combination of dissolving and non-dissolving suture and a postoperative block was infiltrated to the incision site consisting of 9 mL of 0.5% Marcaine plain and 4 mL of dexamethasone. The patient was given Norco 7.5 mg/325 mg for pain control postoperatively and was partial weight bearing to the left heel in a surgical shoe. The patient declined postoperative observation for pain management and was discharged home once cleared by anesthesia. Following the procedure, the patient reported no increased exacerbation of CRPS and admitted to decreased pain to the neuroma site on the left foot. While the patient still reports CRPS pain to the left lower extremity, she is now able to pursue activities of daily living and maintains a tolerable level of pain to the left lower extremity. In conclusion, our outlined pre-operative and post-operative management course for lower extremity surgery of patients with diagnosed CRPS has proven effective in preventing flare-ups of CRPS and preventing increase of active CRPS pain. Pare A. Of the cure of wounds of the nervous parts. In The Collected Works of Ambroise Pare, book 10, pp 400-402, translated by T Johnson, Milford House, Pound Ridge, NY, 1634. Mitchell SW; Morehouse GR, Kenn WW. Gunshot Wounds and Other Injuries of Nerves, pp 148-157, JB Lippincott, Philadelphia, 1864. Stanton-Hicks M, Baron R, Boss R, et al. Complex regional pain syndrome: guidelines for therapy. Clin J Pain. 1998; 14:155-166. Merskey H, Bogduk N. Classification of Chronic Pain: Descriptions of Chronic Pain Syndromes and Definitions of Pain Terms, 2nd edition. Seattle, WA: IASP Press; 1994. Rho RH, Brewer RP, Lamar TJ, Wilson PR. Complex regional pain syndrome. Mayo Found Med Educ Res 77: 174-180, 2002. Oerlemans HM, Oostendorp RA, de Boo T, van der Laan L, Severens JL, Goris JA. Adjuvant physical therapy versus occupational therapy in patients with reflex sympathetic dystrophy/complex regional pain syndrome type I. Arch Phys Med Rehabil. 2000; 81:49-56. Kingery WS. A critical review of neuropathic pain: antidepressants and opioids. Clin J Pain. 2000; 16 (2, suppl):S49-S55. Kemler MA, Barends GAM, van Kleef M, et al. Spinal cord stimulation in patients with chronic reflex sympathetic dystrophy. N Engl J Med. 2000; 343:618-624. Van Hilten BJ, van de Beek W-JT, Hoff JI, Voormolen JHC, Delhaas EM. Intrathecal baclofen for the treatment of dystonia in patients with reflex sympathetic dystrophy. N Engl J Med. 2000; 343: 625-630. Chopra P, Cooper M. Treatment of complex regional pain syndrome using low dose naltrexone. J neuroimmune pharmacol. 2013; 8:470-476. Rea F, Bell JR, Young MR, Mattick RP. A randomized controlled trial of low dose naltrexone for the treatment of opioid dependence. Drug Alcohol Depend. 2004; 75:79-88. Milligan ED, Watkins LR. Pathological and protective roles of glia in chronic pain. Nat Rev Neurosci. 2009; 10:23-26. Moesker A: Complex regional pain syndrome, formerly called Reflex sympathetic dystrophy, treated with Ketanserin and Carnitine (thesis). Rotterdam, Erasmus University Rotterdam, 2000, pp 1-147. Reuben S, Rosenthal E, Steinberg R. Surgery of the affected upper extremity of patients with a history of complex regional pain syndrome: a retrospective study of 100 patients. J of Hand Surgery. 2000; 6:147-151. Katz MM, Hungerford DS: Reflex Sympathetic Dystrophy Affecting the knee. J Bone Joint Surg. 1987; 69: 797 – 803. R. Norman Harden, MD, Stephen Bruehl, PhD, Michael Stanton-Hicks, MB, BS, DMSc, FRCA, ABPM, Peter R. Wilson, MB, BS; Proposed New Diagnostic Criteria for Complex Regional Pain Syndrome. Pain Med 2007; 8 (4): 326-331. Fanelli, G, Borghi, B, Casati A, et al. Unilateral bupivacaine spinal anesthesia for outpatient knee arthroscopy. Can J Anesth 2000; 47 (8):746-751. Koenig T, Neumann C, Ocker T, Kramer S, et al. Estimating the time needed for induction of anesthesia and its importance in balancing anaesthetists’ and surgeons’ waiting times around the start of surgery. Anaesthesia 2011; 66:556-562. Ben-David B, Levin H, Solomon E, Admoni H, Vaida S. Spinal bupivacaine in ambulatory surgery: the effect of saline dilution. Anesth Analg 1996; 83: 716–20. Valanne J, Korhonen AM, Jokela R, Ravaska P. Selective spinal anesthesia: A comparison of hyperbaric bupivacaine 4 mg versus 6 mg for outpatient knee arthroscopy. Anesth Analg 2001; 93: 1377-9. Mulroy M, Larkin K, Hodgson P, et al. A comparison of spinal, epidural, and general anesthesia for outpatient knee arthroscopy. Anesth Analg 2000; 91:860-4.